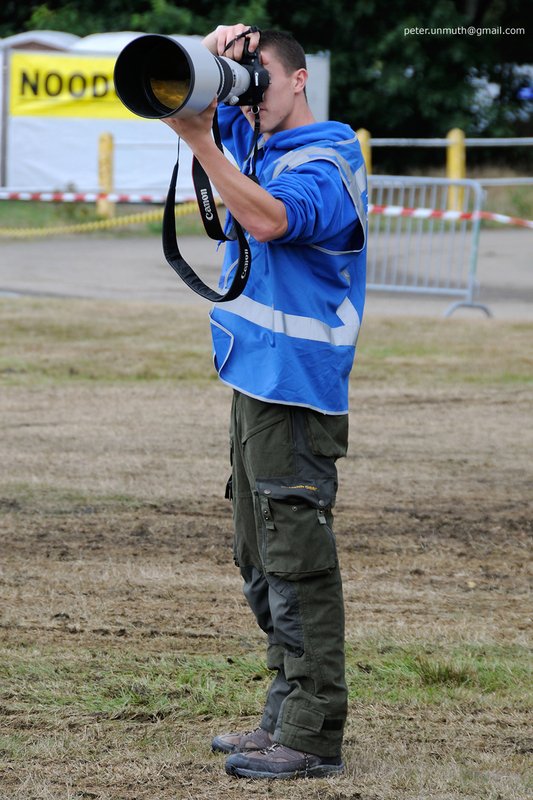 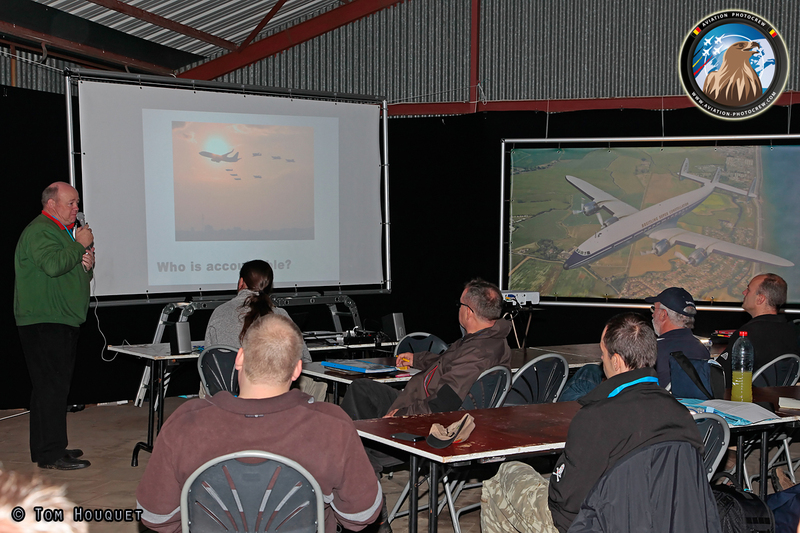 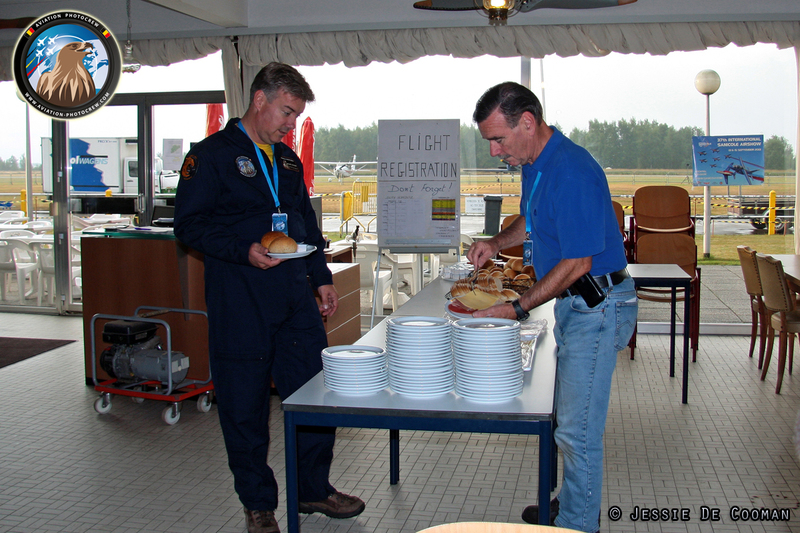 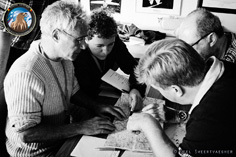 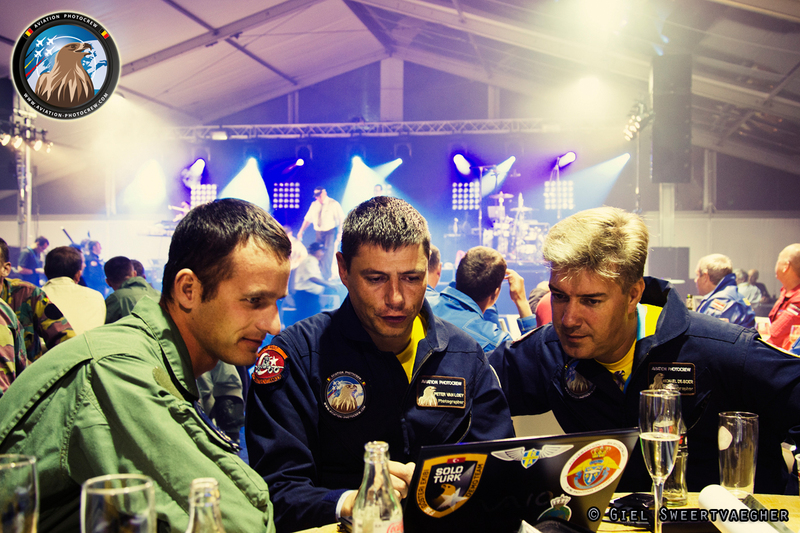 Time flies when you’re having fun - it was already the fourth edition of the Air-to-Air Academy, taking place from September 11-16, 2013. 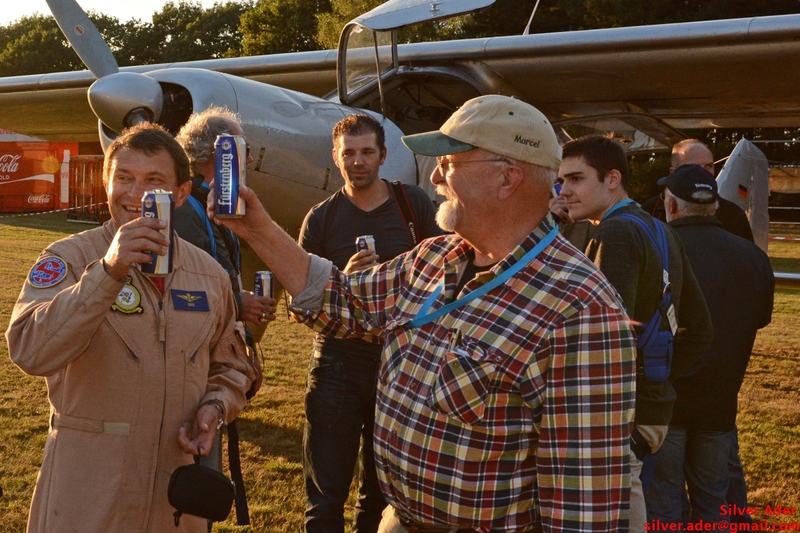 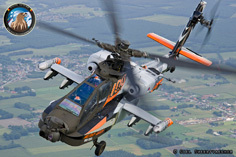 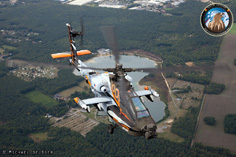 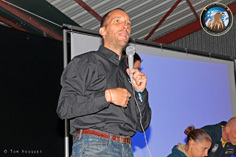 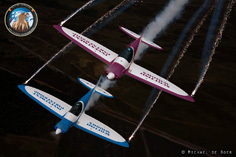 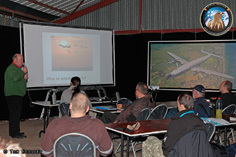 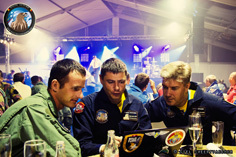 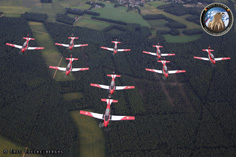 For the occasion, a new cooperation was set up, with the famous Sanicole Airshow at the Leopoldsburg Airfield. 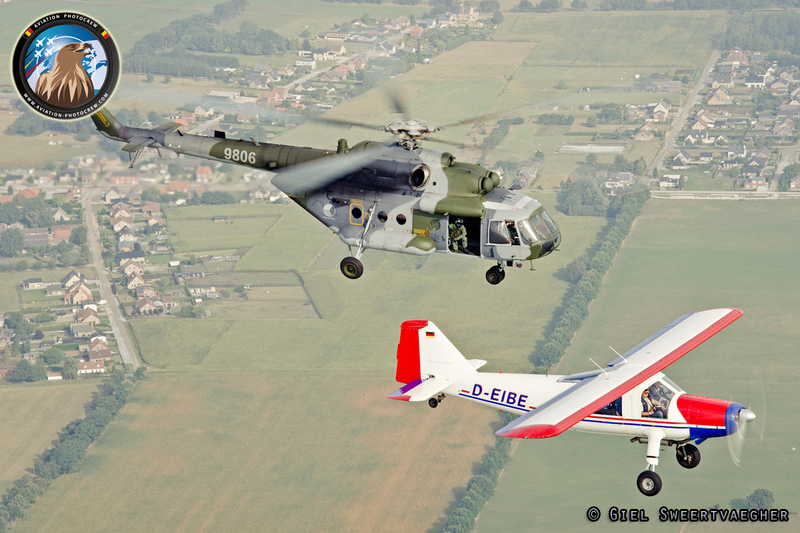 As the Airshow attract the best of the European Airshow scene, a nice variety of aircraft attended, which made for some unique photo opportunities for the many photographers visiting the Academy. 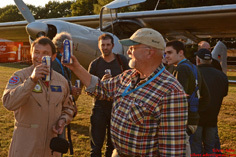 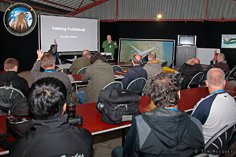 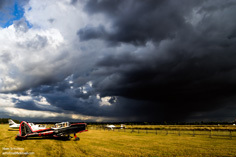 Over 50 photographers from around the world gathered at the small airfield of Sanicole and it was great to meet so many familiar faces and welcoming some new friends. One of the great things about the Academy is that the photographers are becoming a big family of friends, and the event is the yearly reunion. 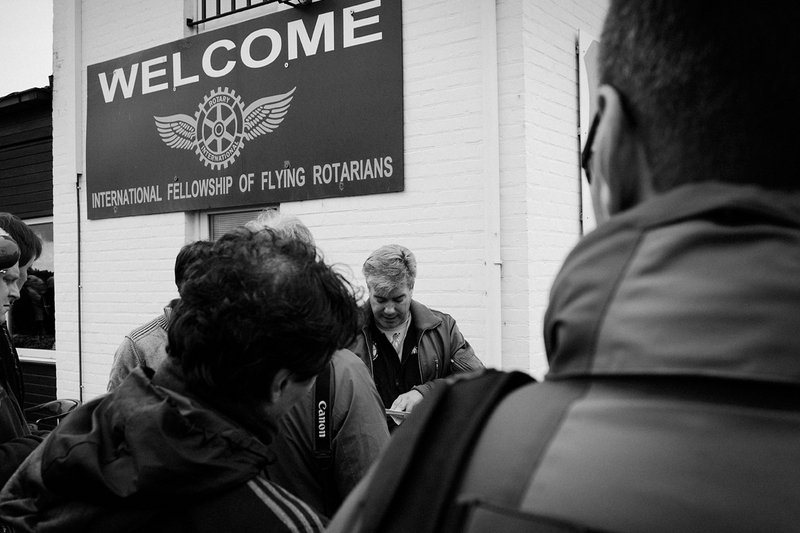 On Wednesday morning, everyone was welcomed by the Chairman Eric Coeckelberghs in the dedicated Academy hangar which was nicely decorated for the occasion. 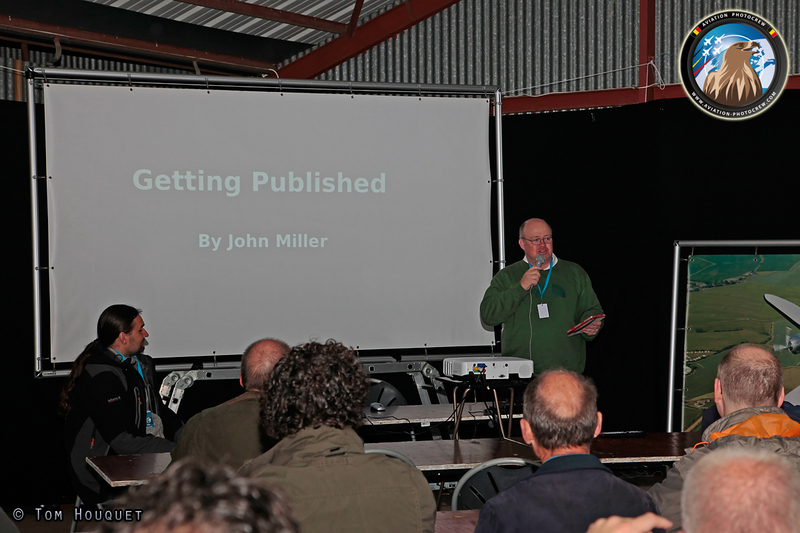 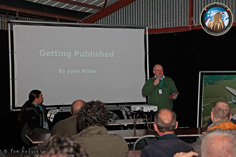 In the morning it was time for some interesting Lectures by John Miller, talking about getting published, while Daniel Rychcik explained some of his experiences with photoflying. 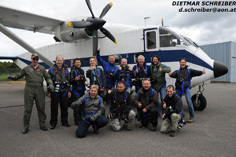 The important safety lectures of past years were repeated followed by the try-out of the safety harnesses used in the Skyvan and Dornier. 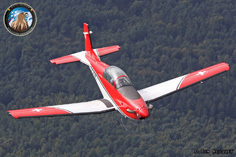 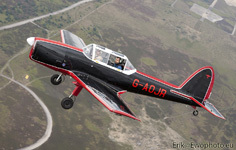 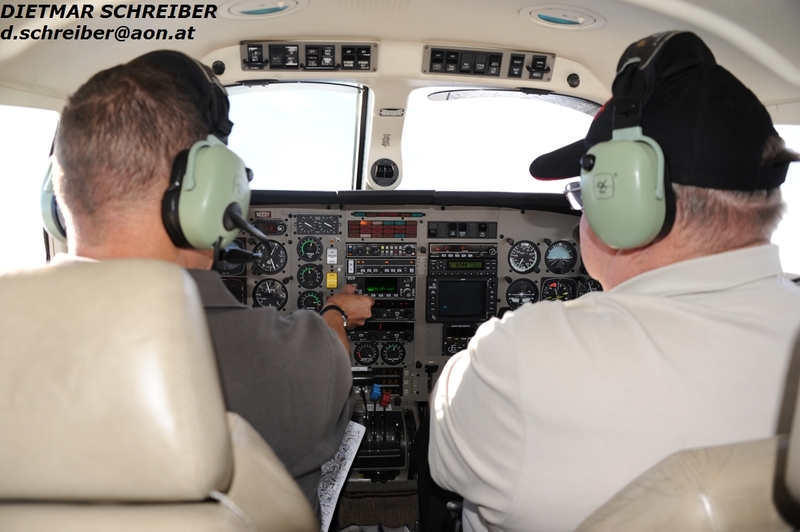 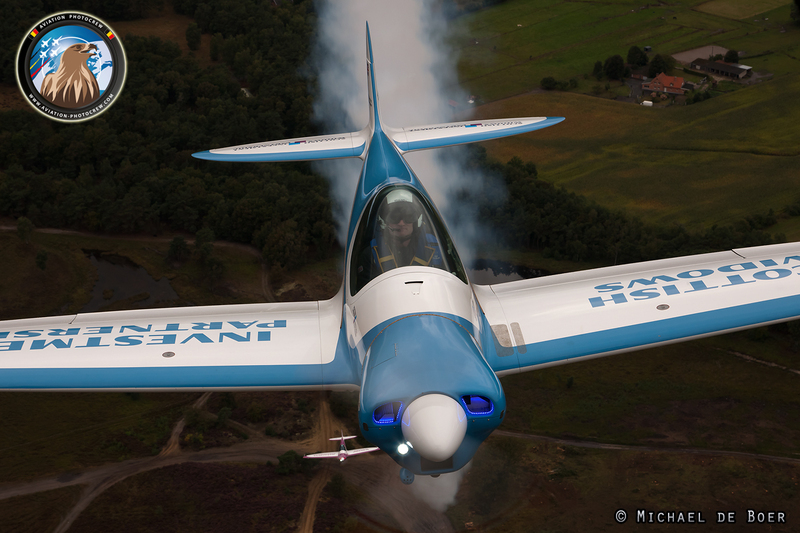 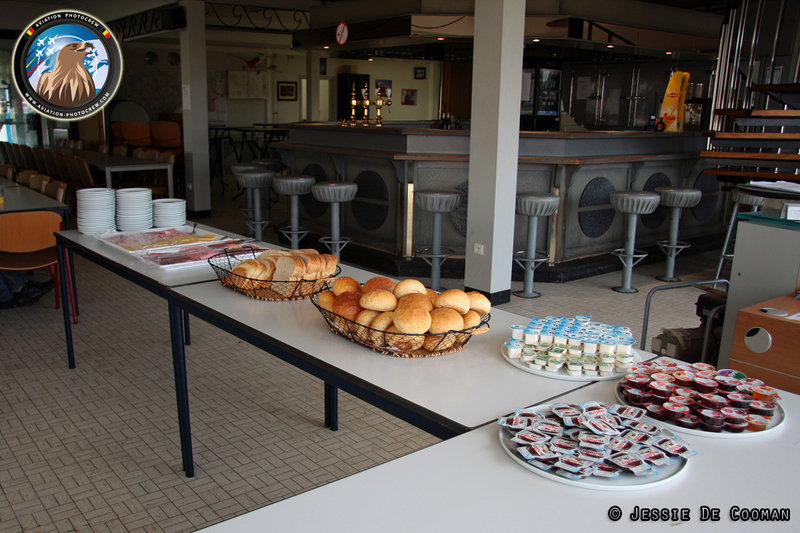 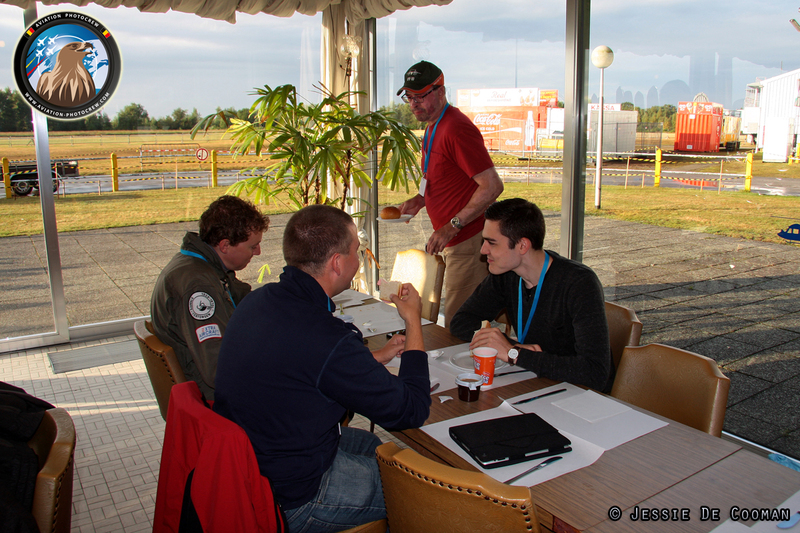 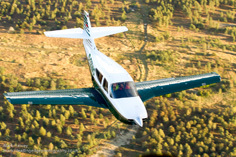 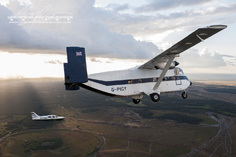 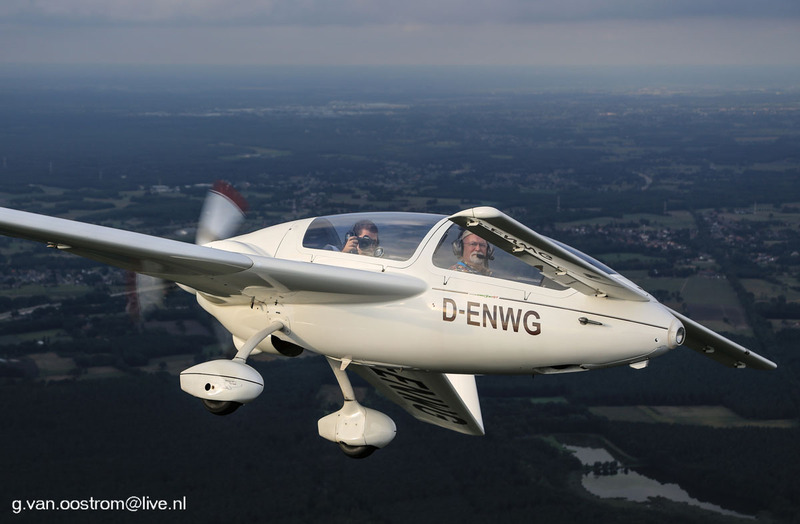 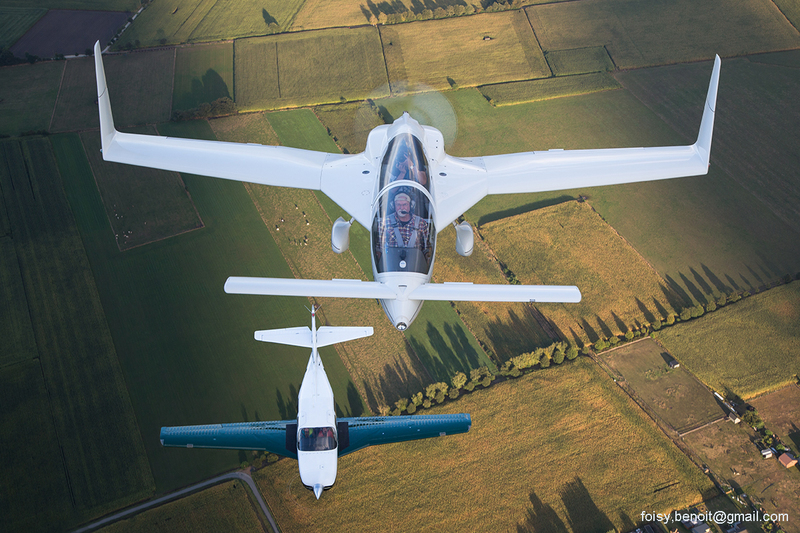 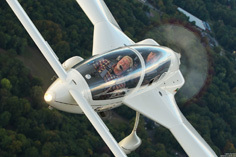 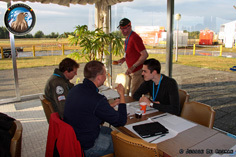 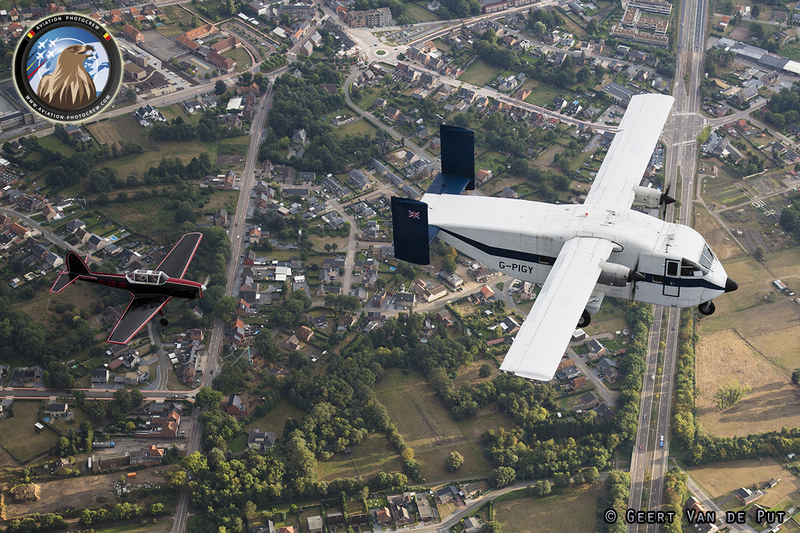 After a great lunch in the Aeroclub, it was time to prepare the aircraft for the first photoflights of the 2013 Academy. On the airfield a nice line-up of aircraft and photoships were present and in the evening they all went up in the air. 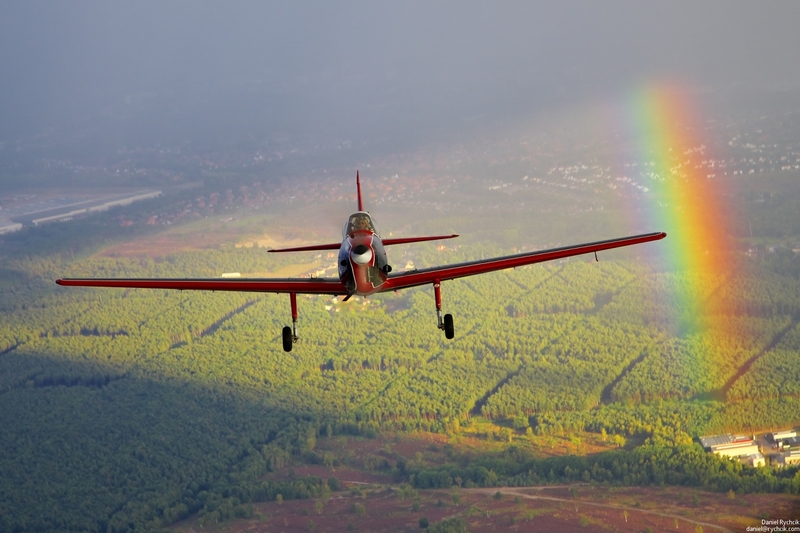 The Avenger, T-6, Chipmunk, Commander and Speedcanard, two Do-27 and the Skyvan flew a great sortie in very interesting weather conditions with a nice rainbow coloring the sky. 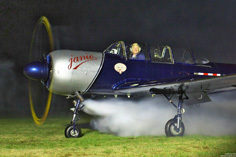 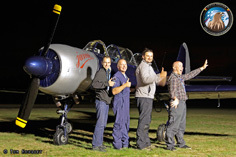 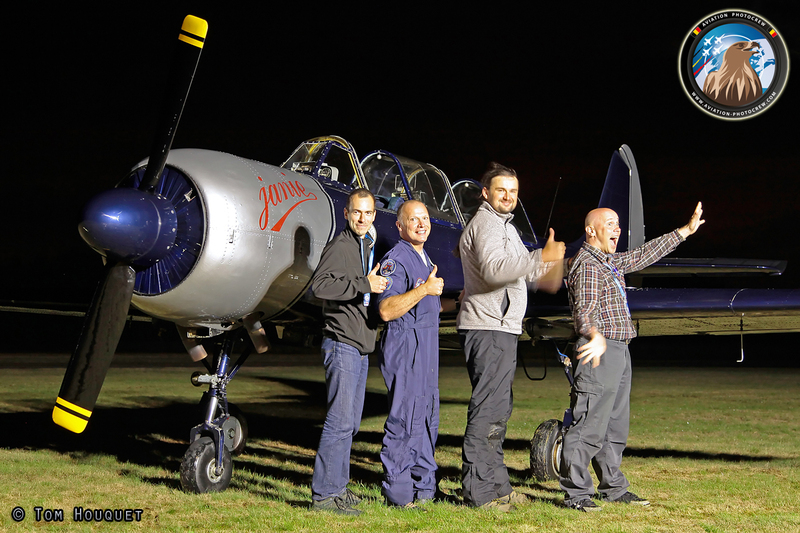 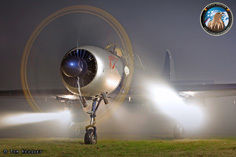 After dark, it was not yet time to put the camera’s away as the Avenger and the Yak-52 were so generous to start their engines for a great nightshoot. 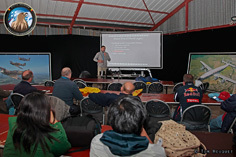 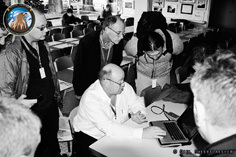 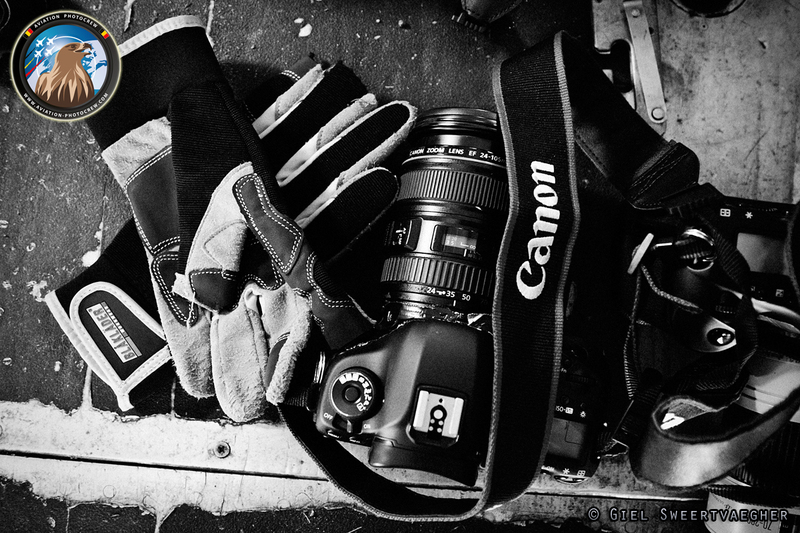 Thursday morning, some new lectures were presented to the photographers. 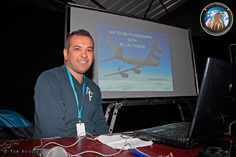 John Miller talked about his experiences organizing photoflights, while our special Turkish guest Alperen Akharman talked about his work as KC-135 boom operator and his experiences with photographing out of his tanker aircraft. 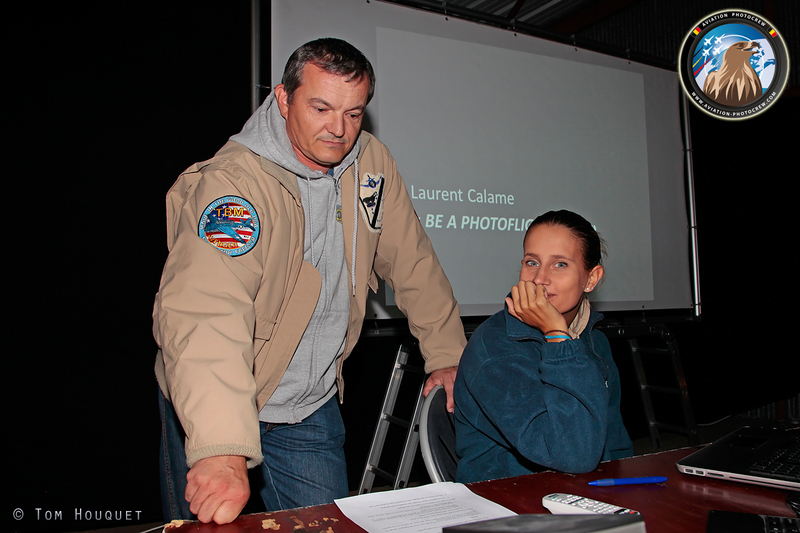 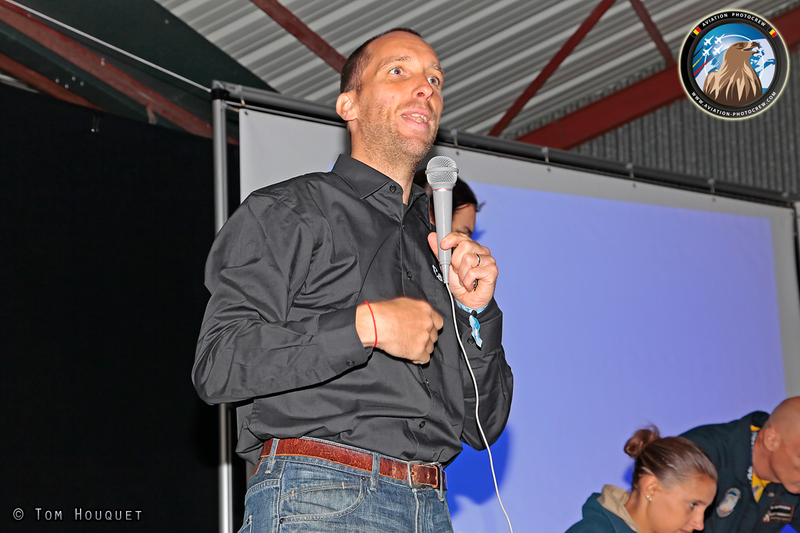 Laurent Calame, pilot of the Avenger also did a very interesting lecture about his experience as photo pilot both as photo object and photoship. This year we also had the great pleasure to have Canon Professional Services as partner, they gave a great introduction of what the professional services have to offer, as well as the possibility to use some of their newest high-range camera’s and lenses. 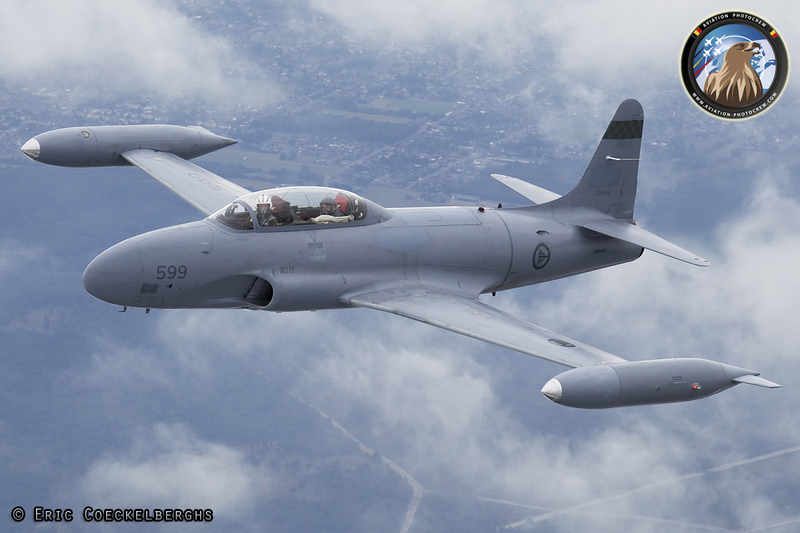 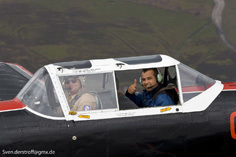 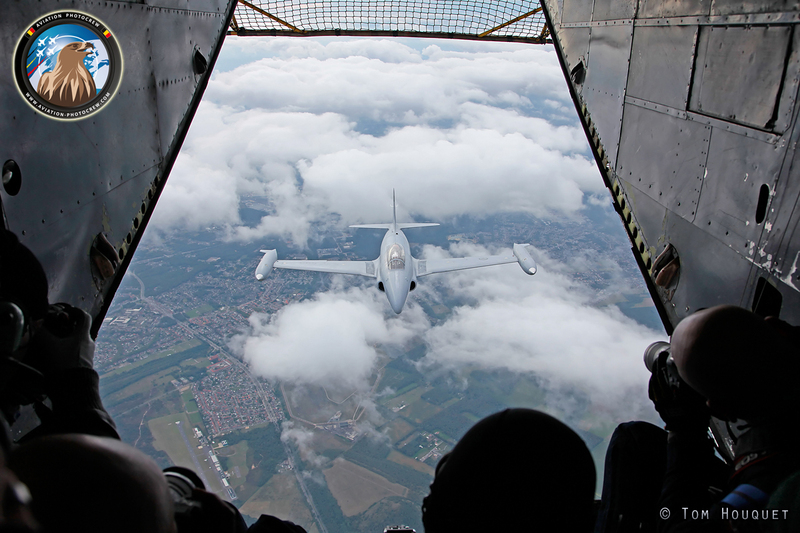 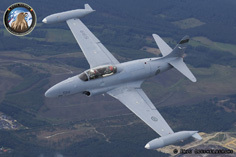 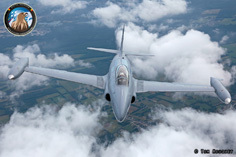 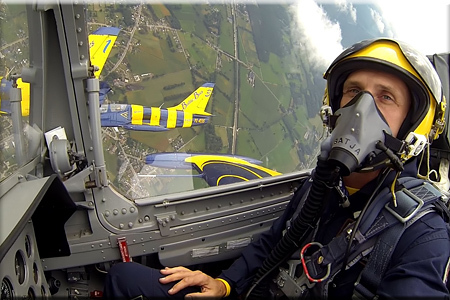 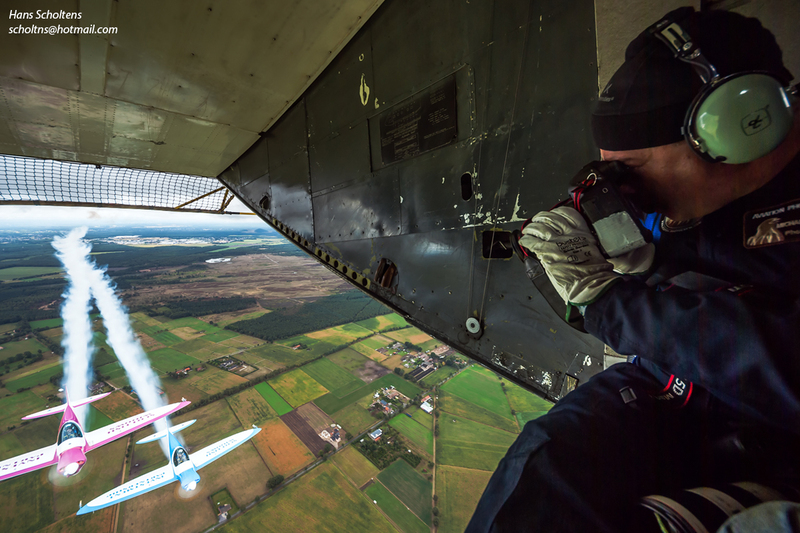 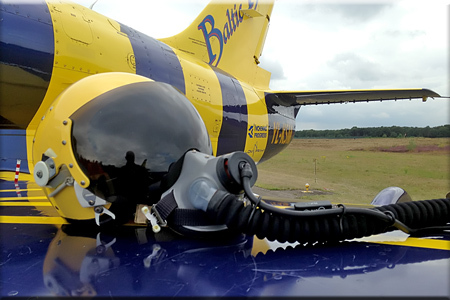 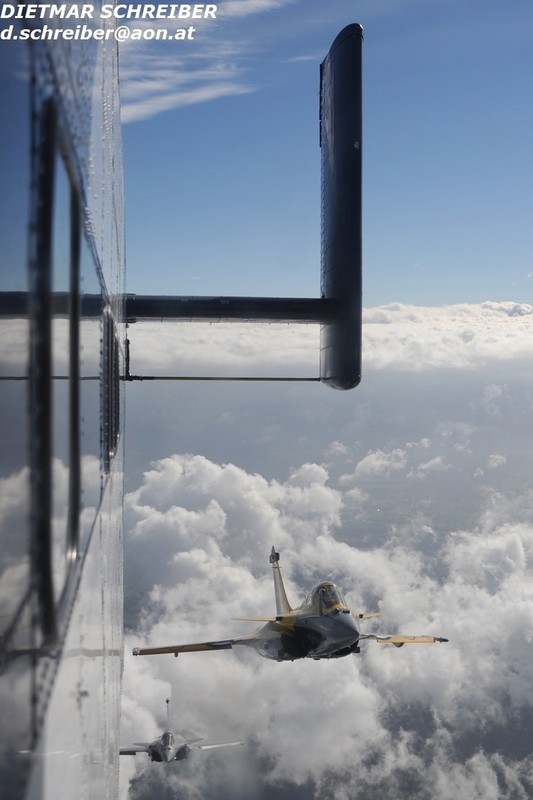 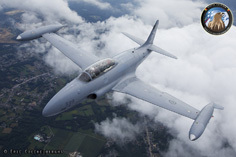 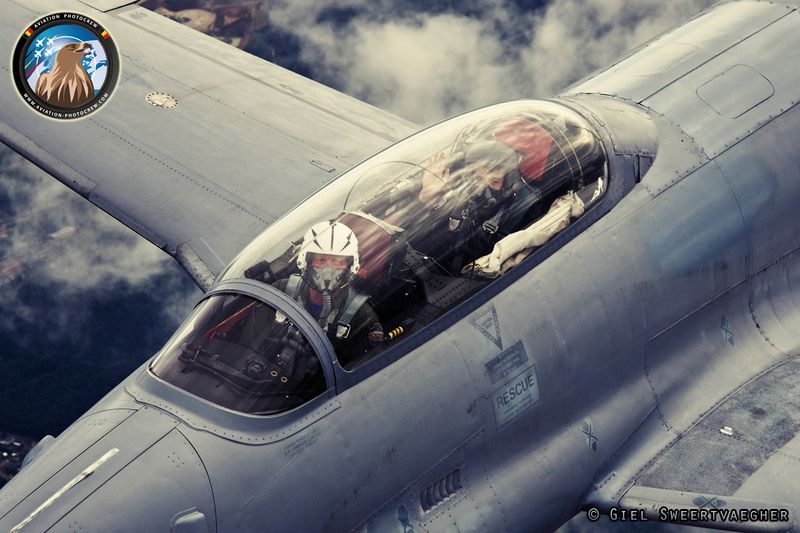 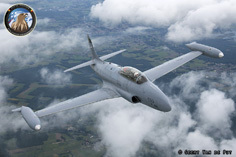 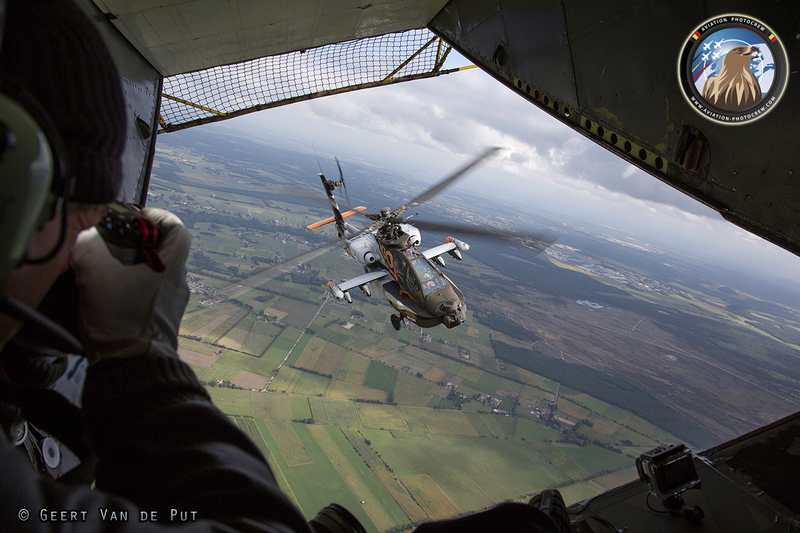 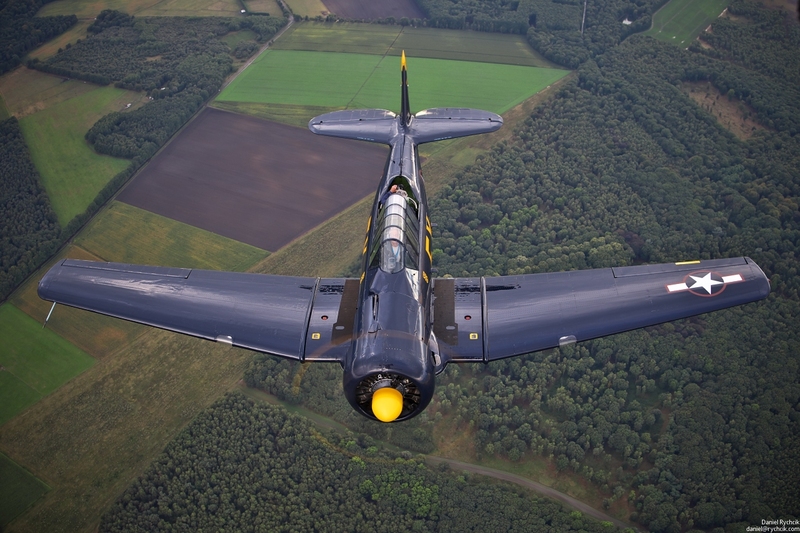 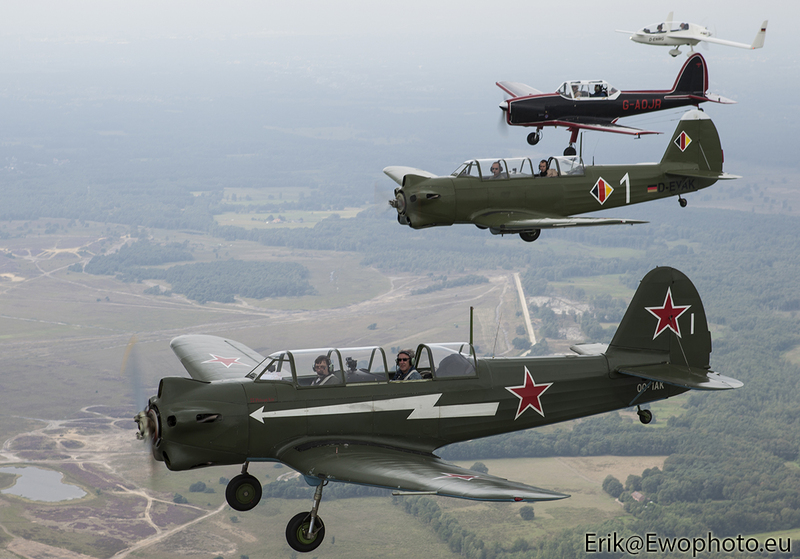 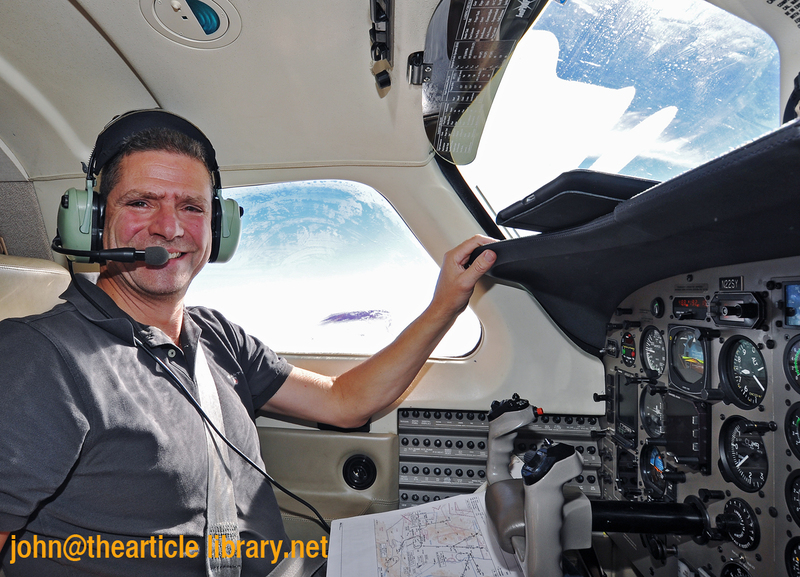 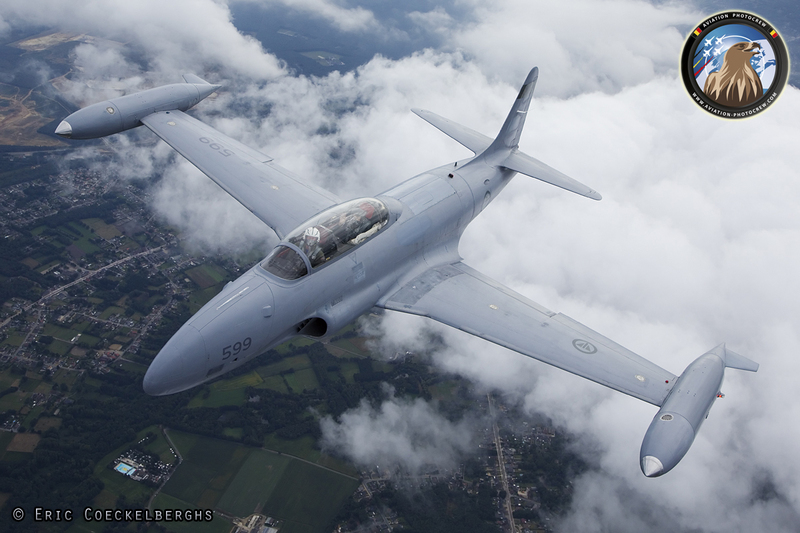 For some of the Aviation PhotoCrew members it was an unforgettable day, as in the afternoon they had the opportunity to fly in the backseat of the Baltic Bees L-39 during an awesome pleasure flight. 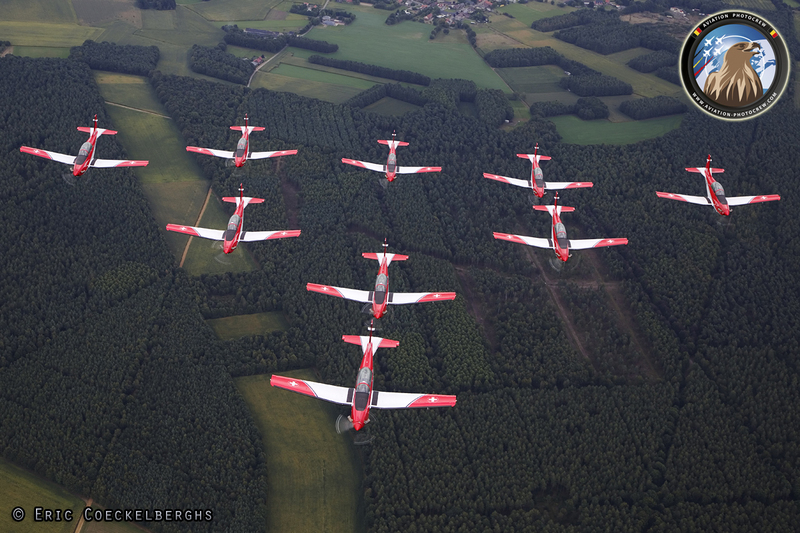 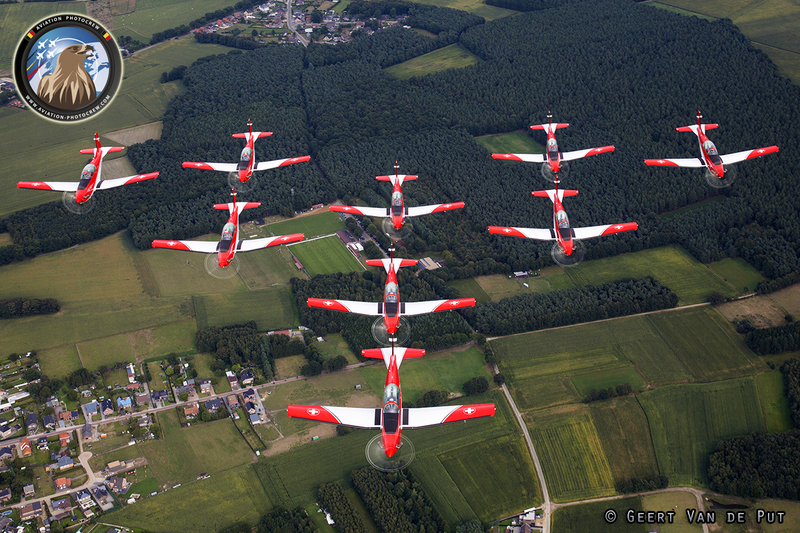 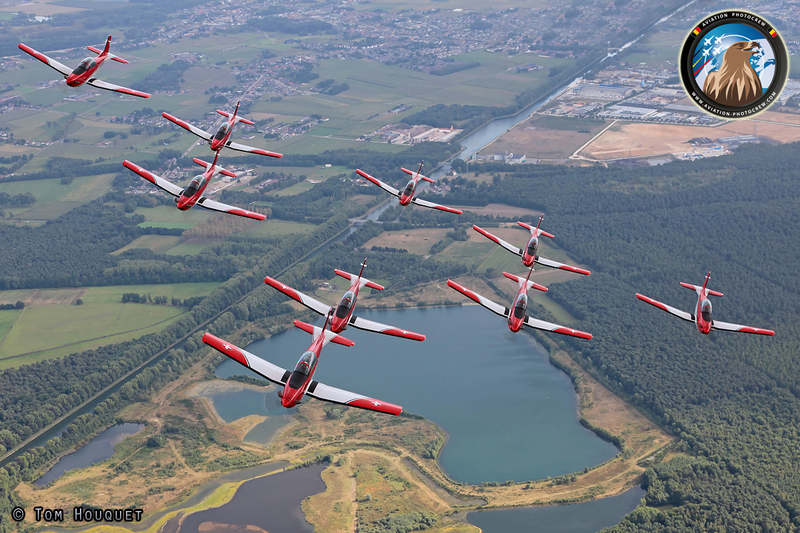 After a formation take-off, the team performed some gentle formation aerobatics, ending with a hard break over Kleine Brogel Airbase and a solo pass and some fast rolls before landing, what a great experience! 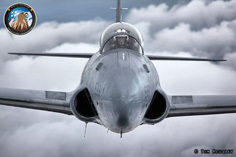 The 2013 edition of the Academy will go into the history books as the Jet-edition. 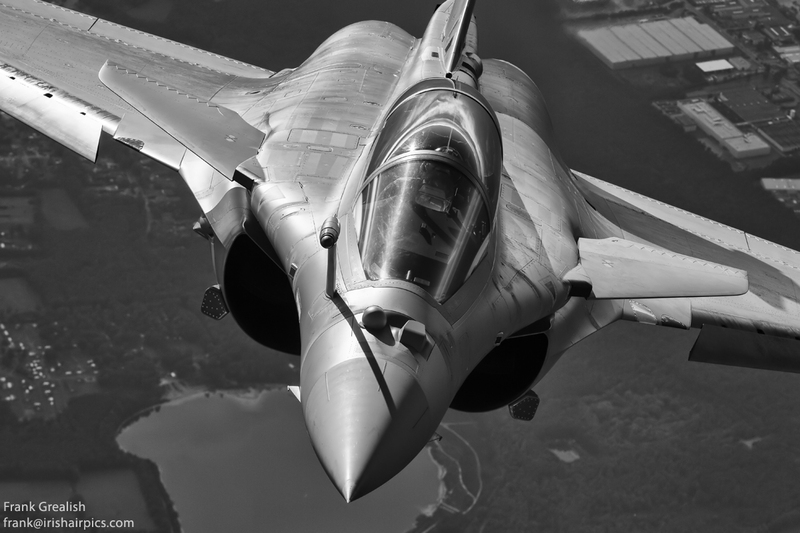 The first Jet to appear in front of the Camera’s was the French dual-seat Rafale on Thursday afternoon after his demo-rehearsal over Sanicole, what a great opening! 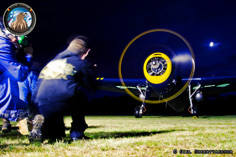 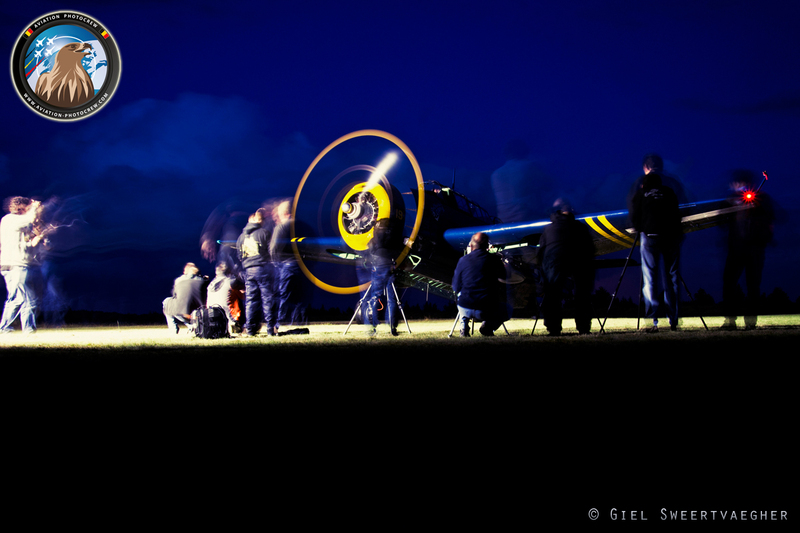 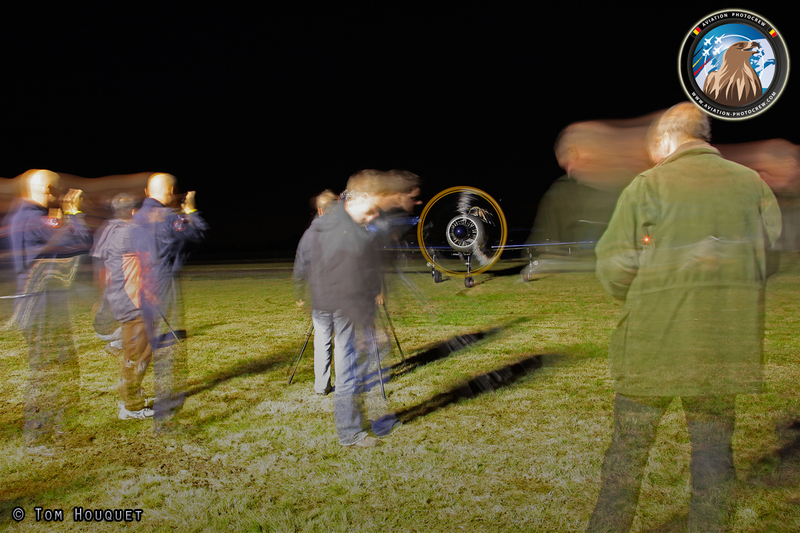 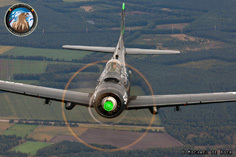 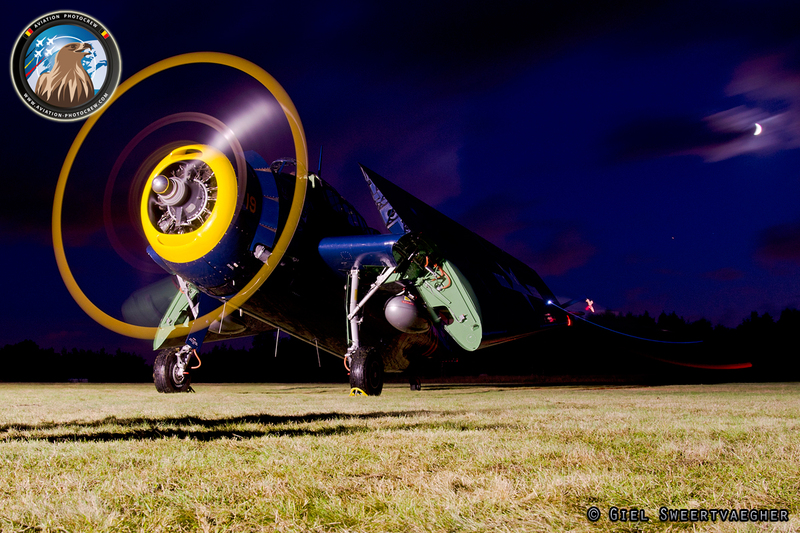 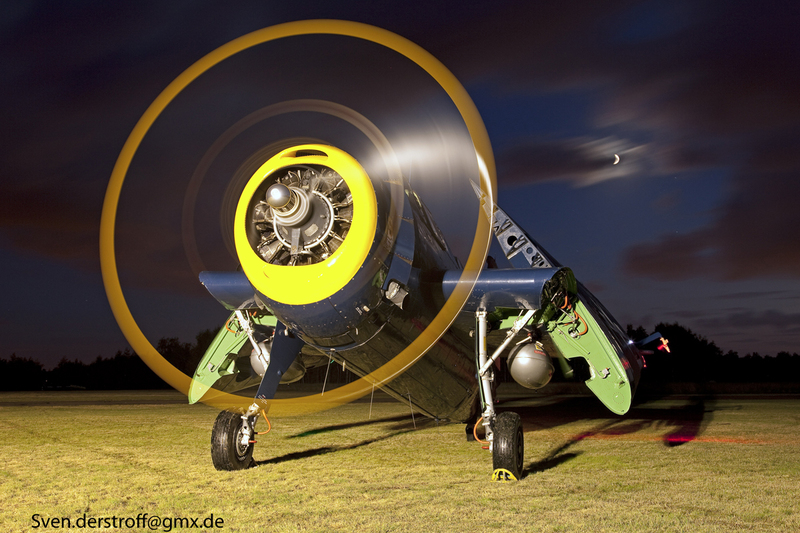 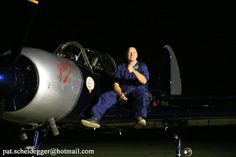 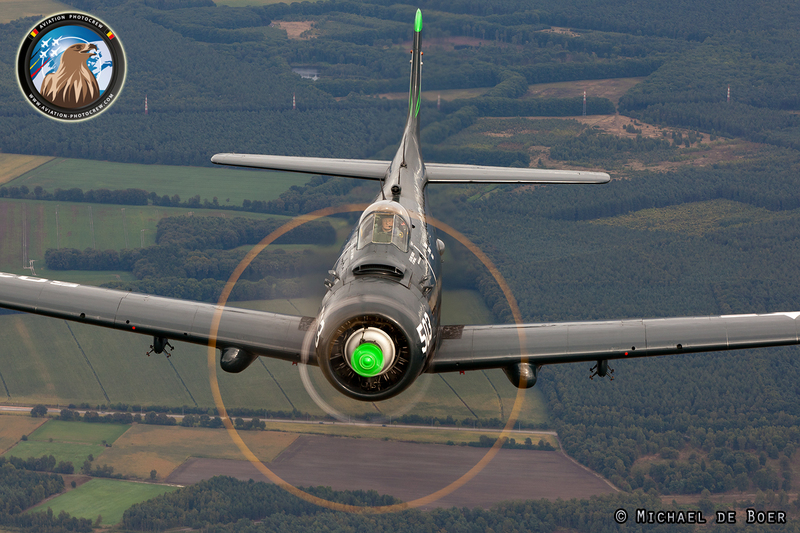 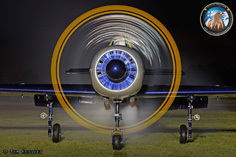 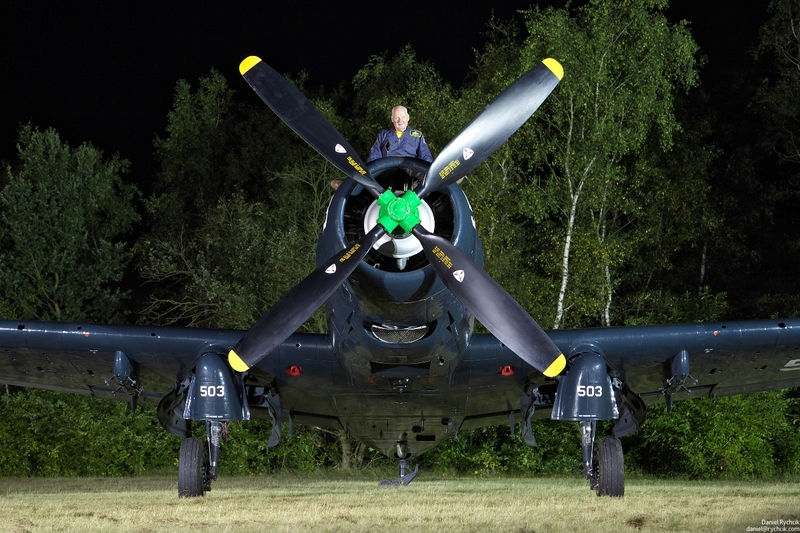 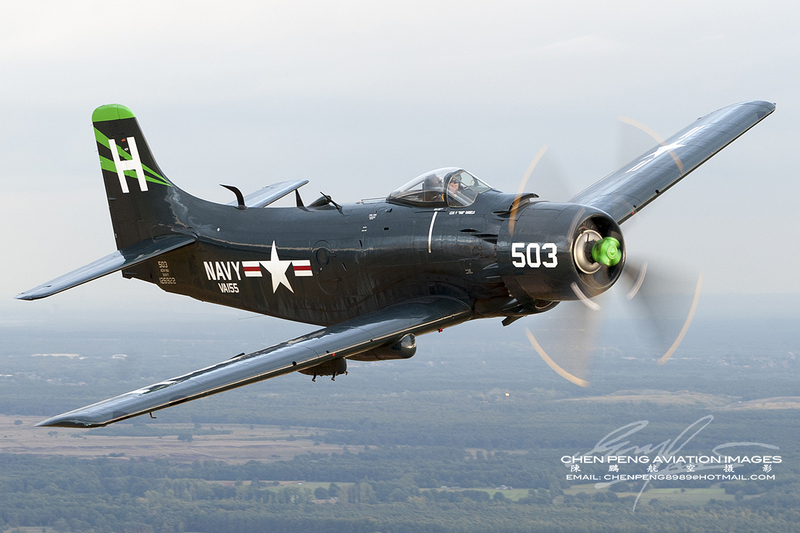 In the evening some more nightshoots were performed with the blue Skyraider as the star of the evening. 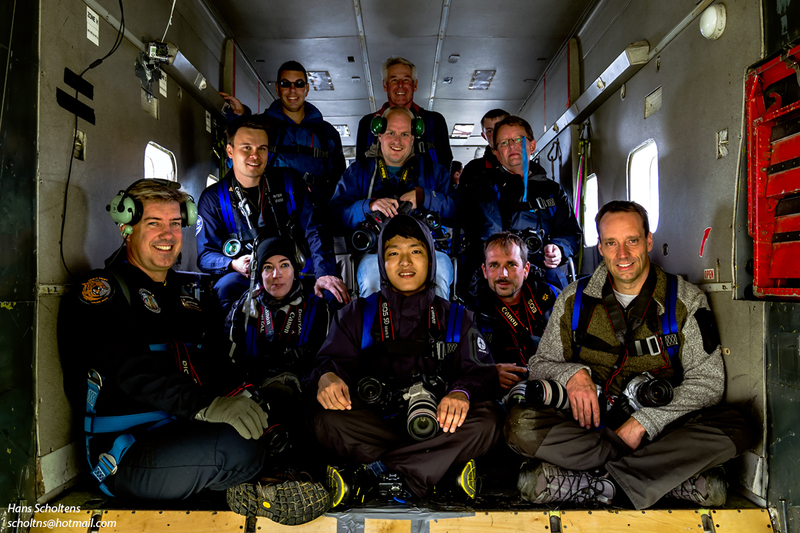 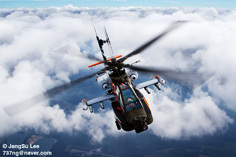 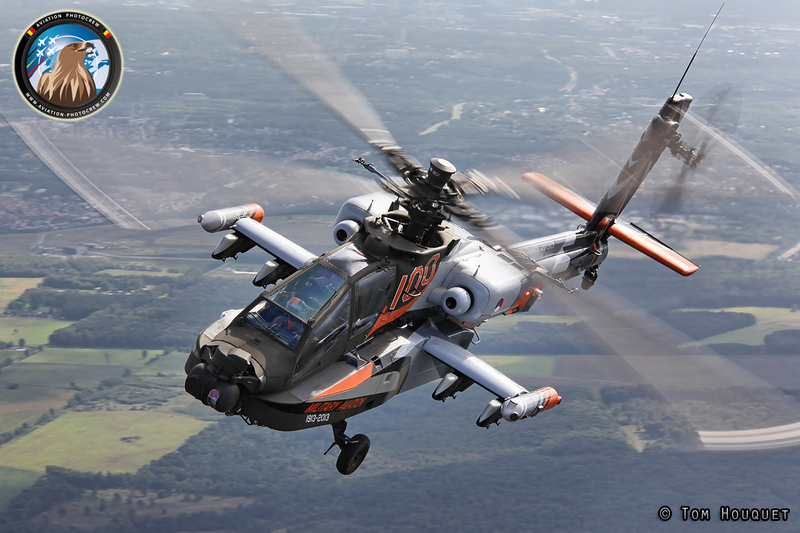 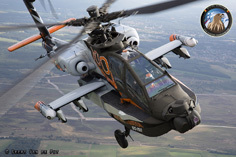 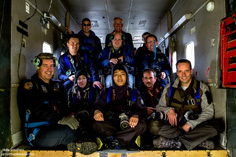 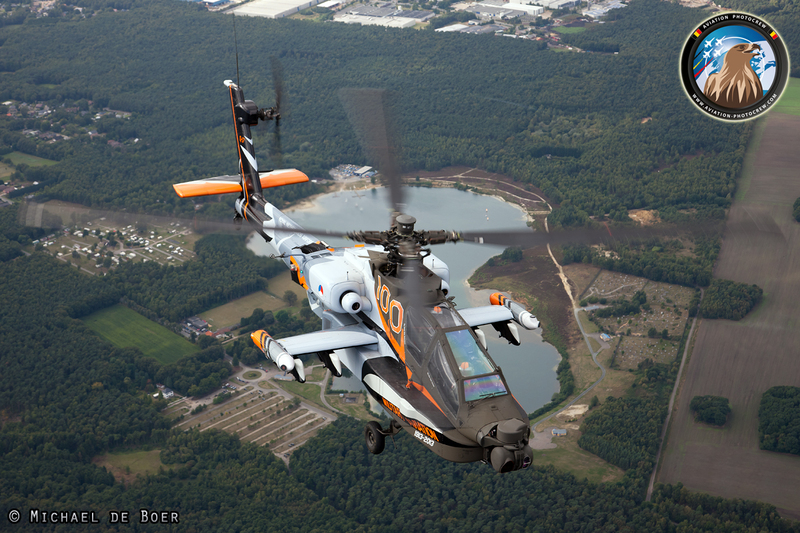 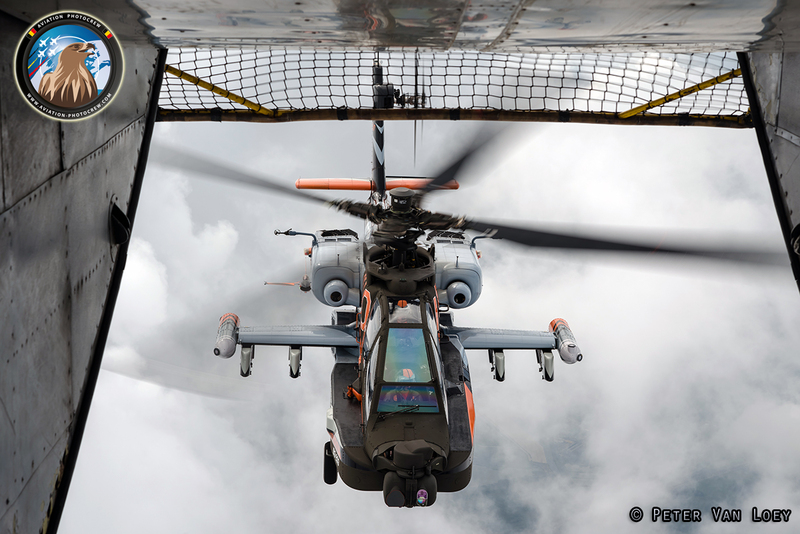 On Friday, some photographers were treated with a very special mission. 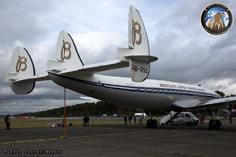 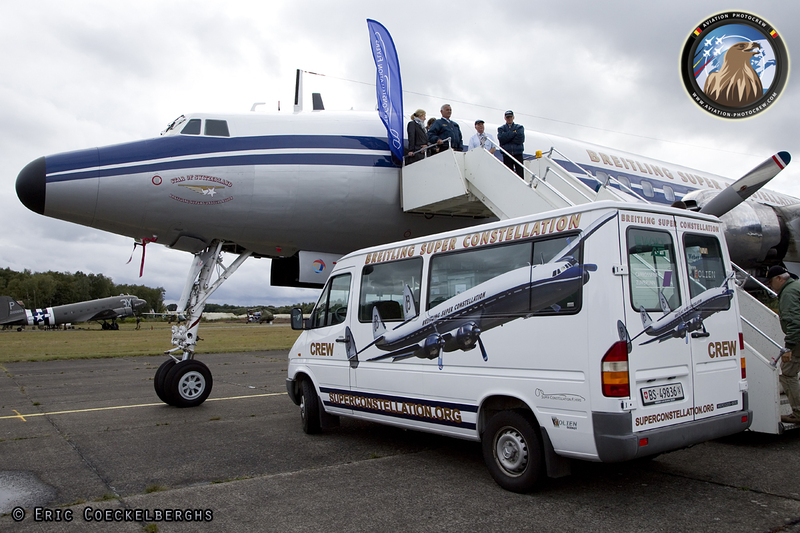 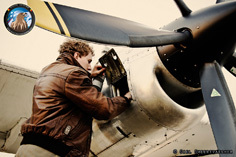 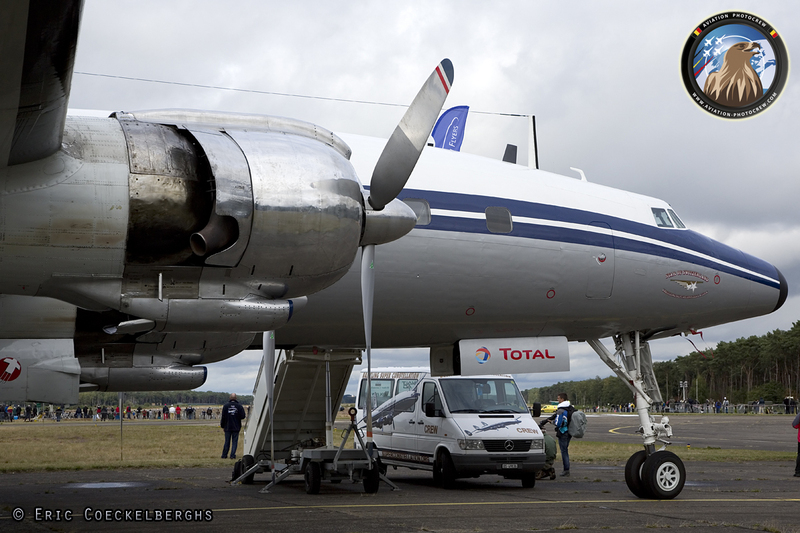 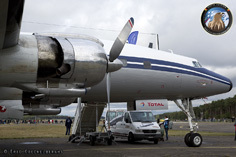 For some year now, the Breitling Constellation is trying to come over to Belgium and this year they finally succeeded. 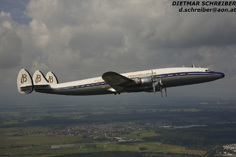 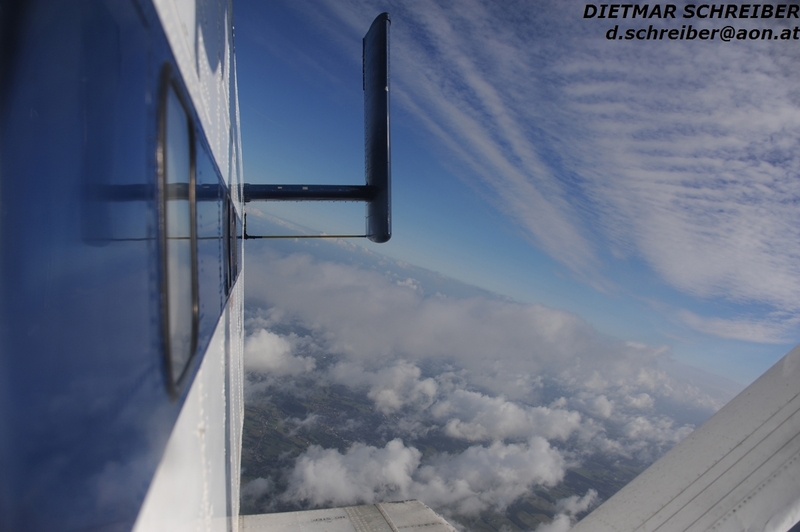 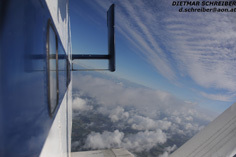 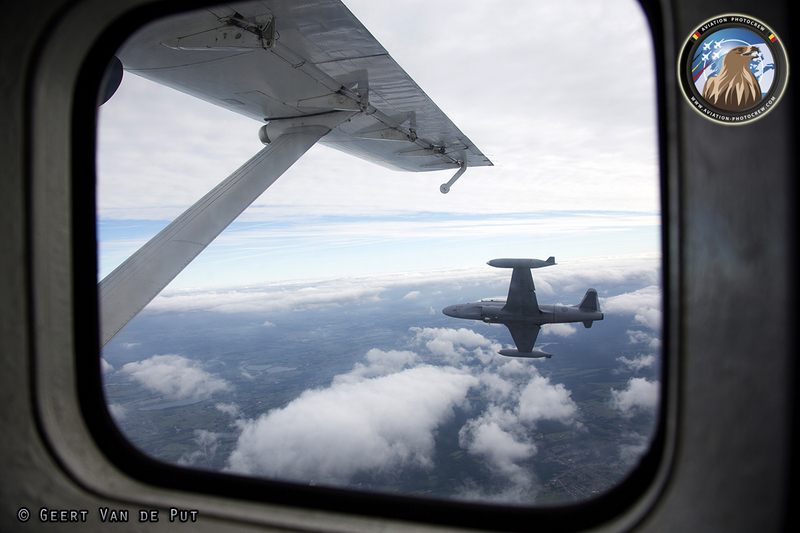 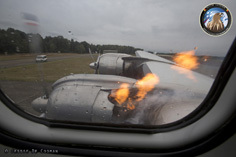 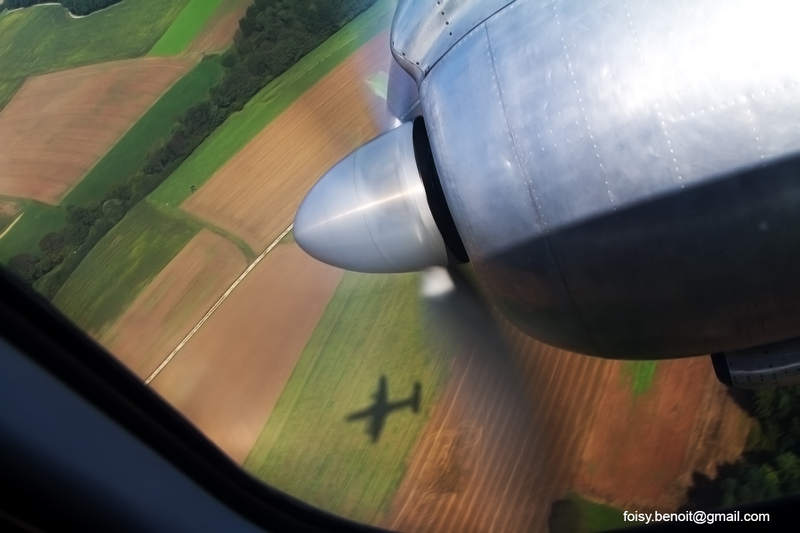 Some of the photographers had the honor to be passenger on board the Connie on the flight from Basle to Kleine Brogel. 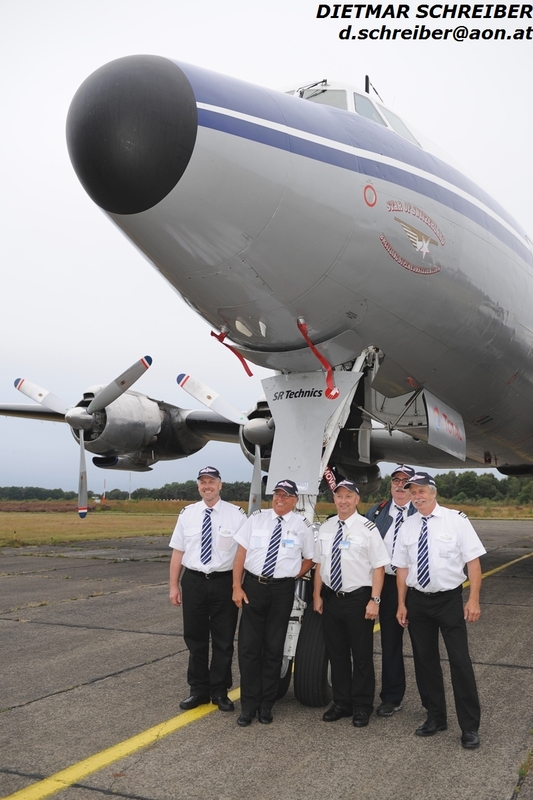 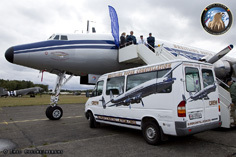 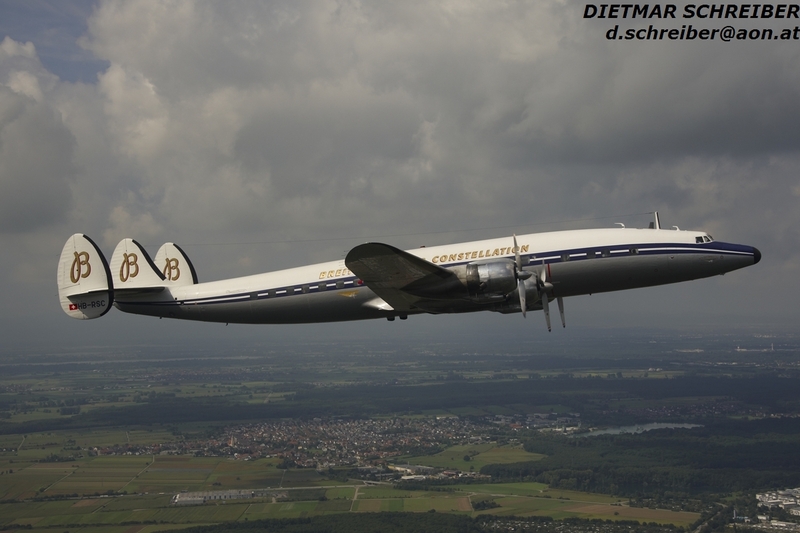 With a private aircraft they were flown over from Maastricht to Basle, returning onboard the mighty Super Constellation, an experience of a lifetime! 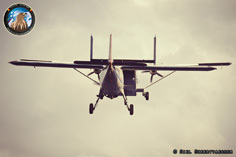 At Sanicole some unique flights were performed as well. 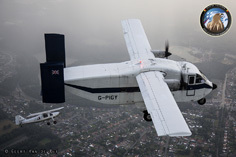 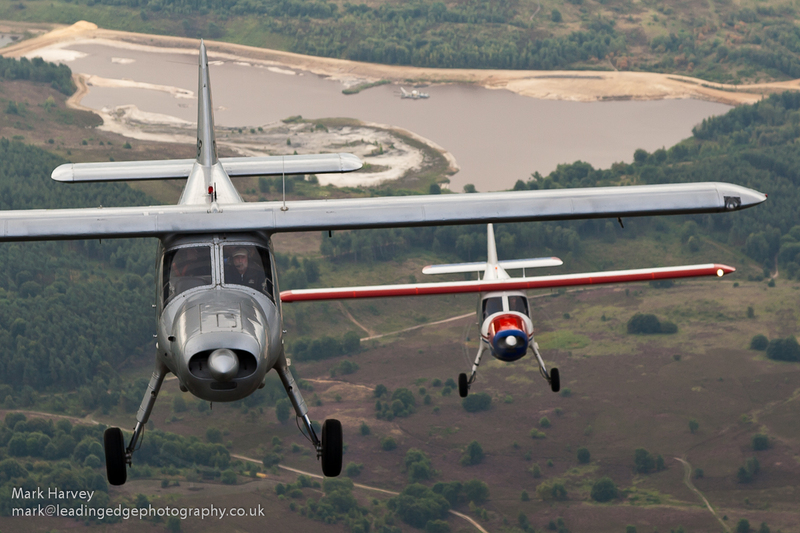 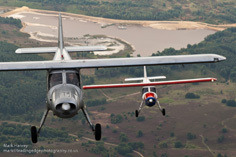 Not only the Skyvan went up in the air, but the Dorniers also acted as an awesome photoplatform, taking four photographers in each aircraft. 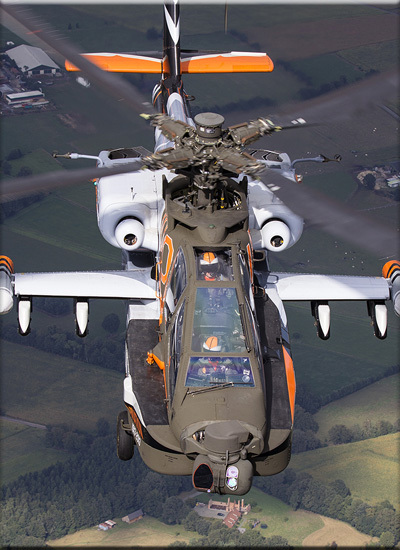 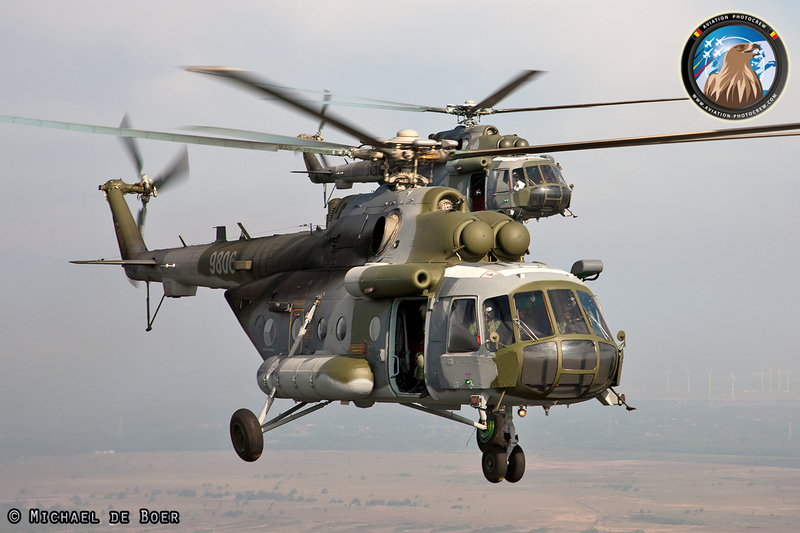 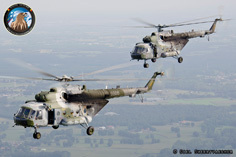 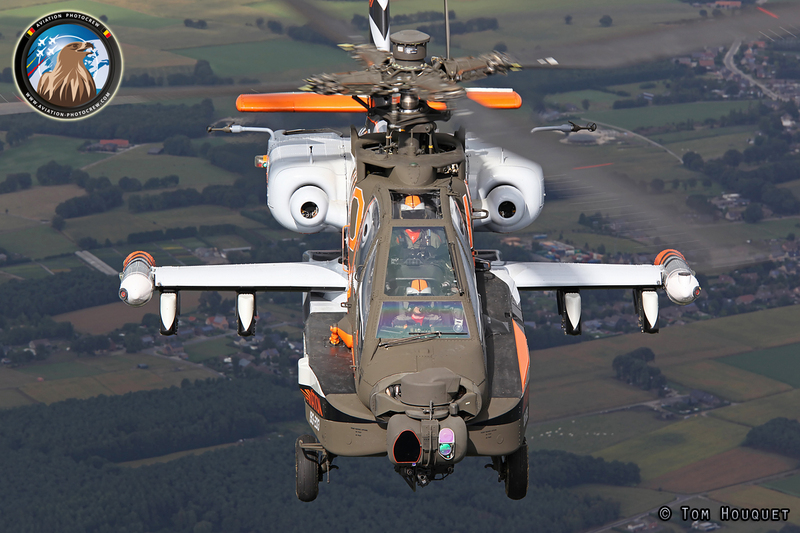 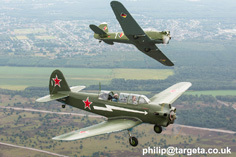 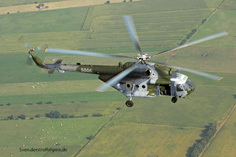 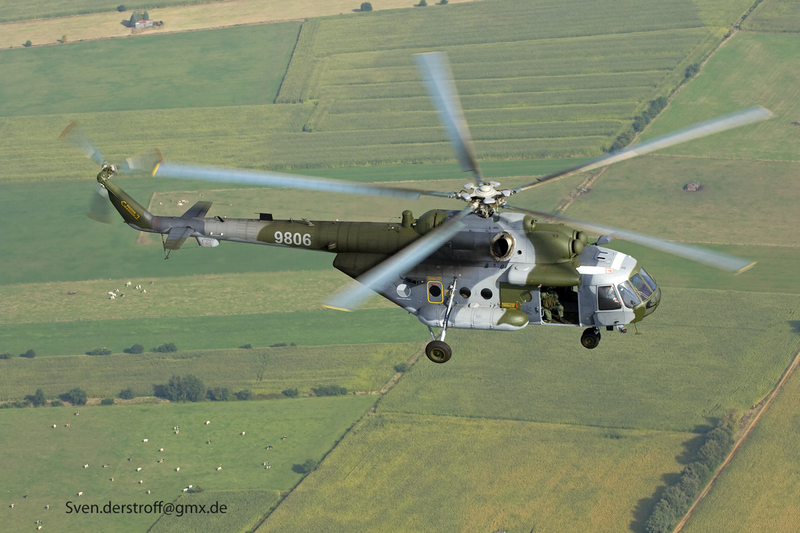 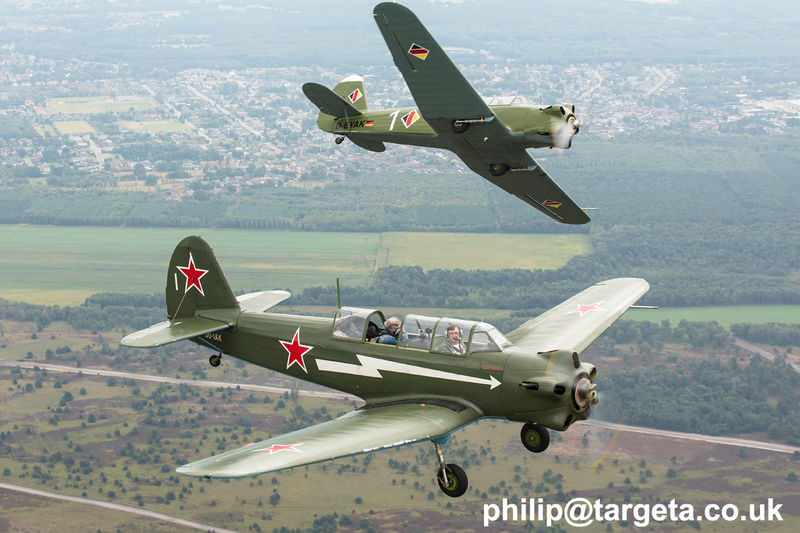 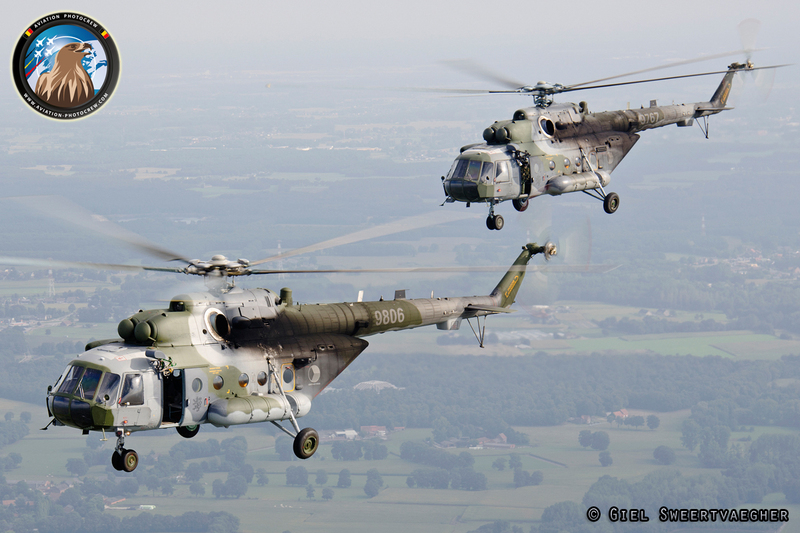 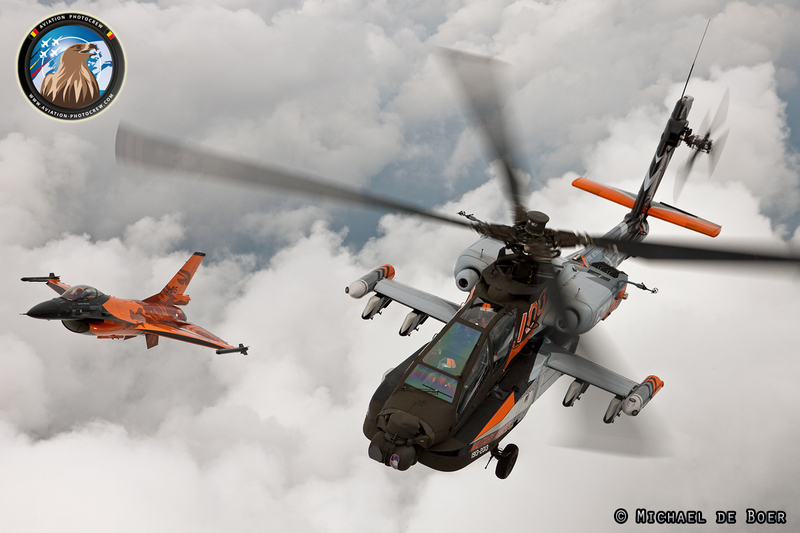 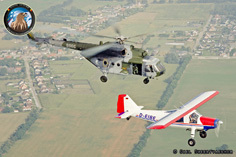 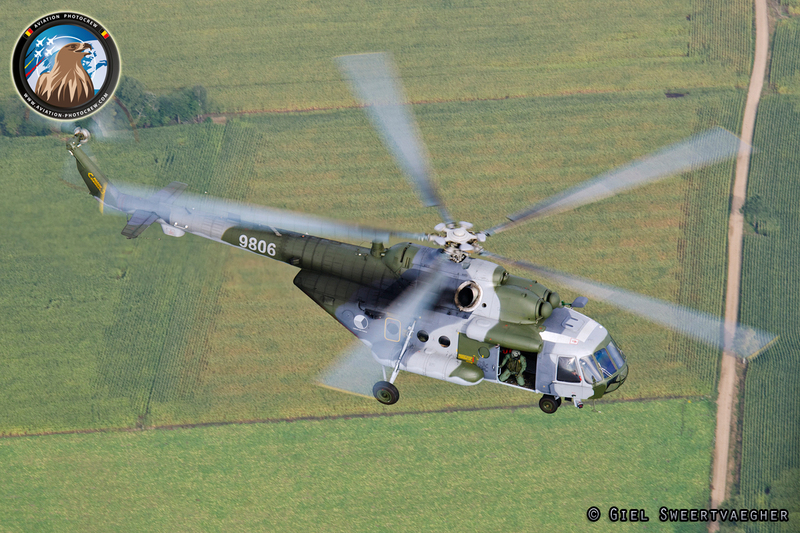 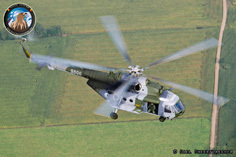 The Dorniers were joined by an awesome formation of two Czech Air Force Mi-171 Helicopters. 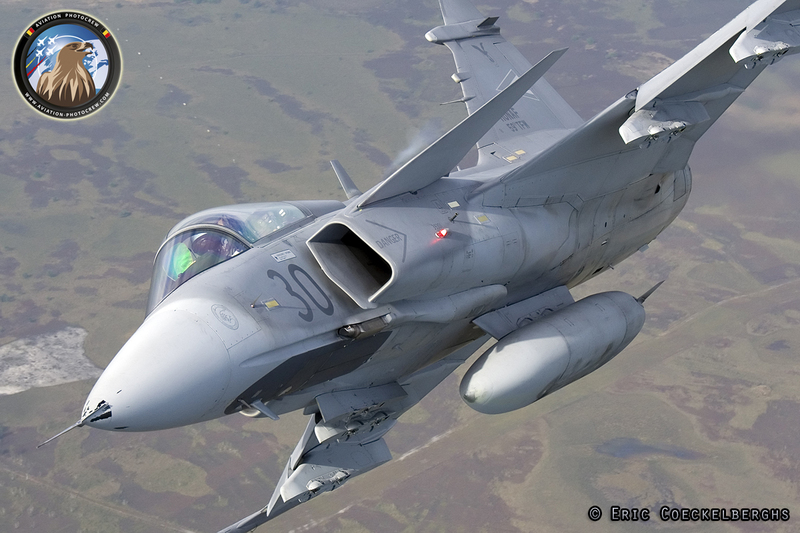 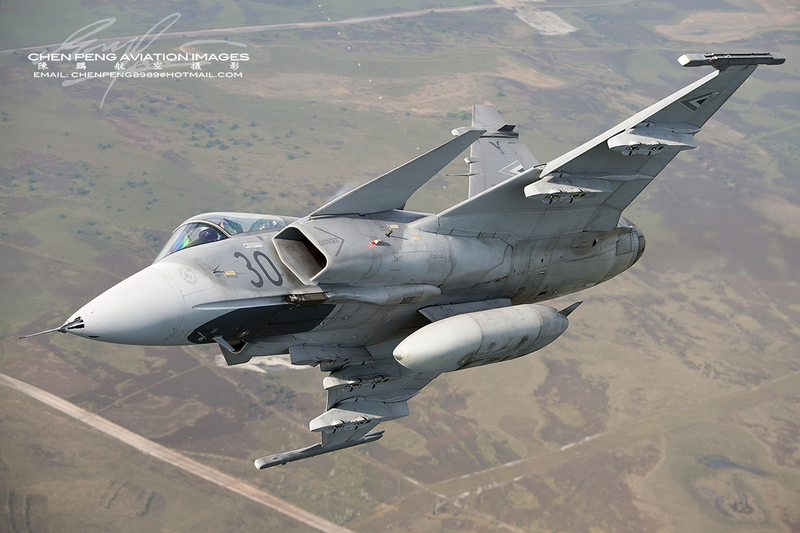 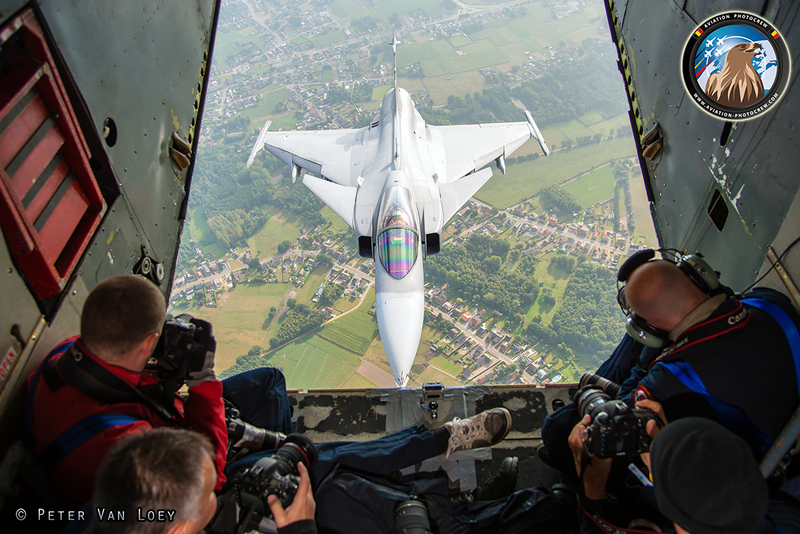 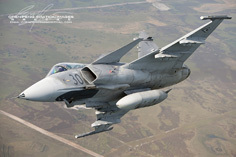 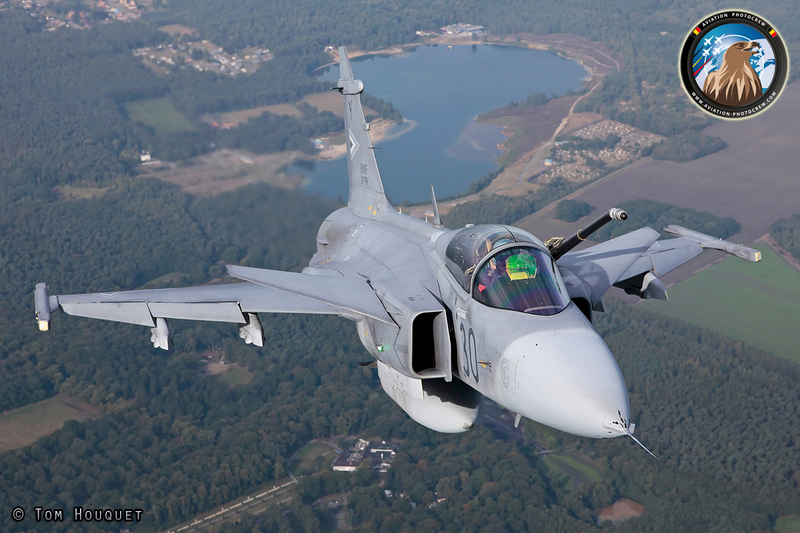 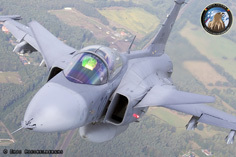 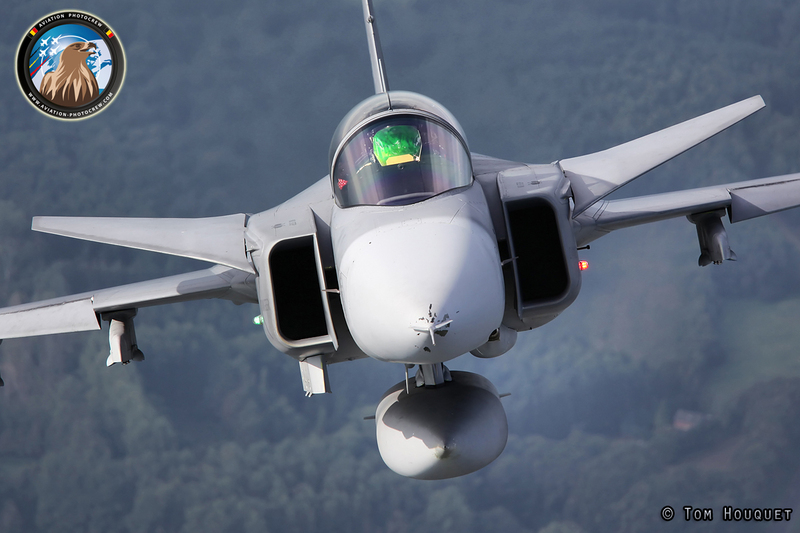 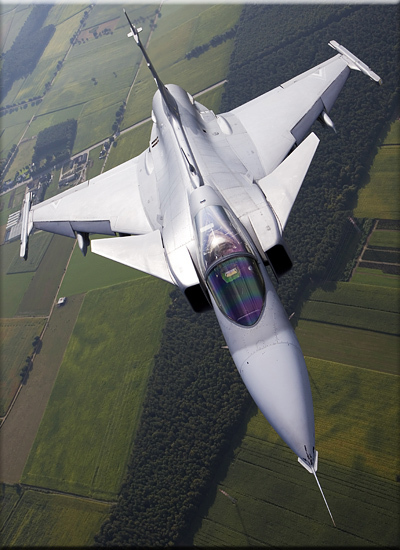 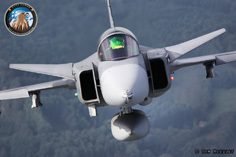 One of the special guests performing at the Sanicole Airshow was the Hungarian Air Force Gripen. 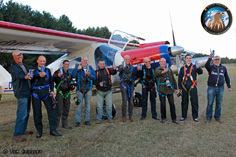 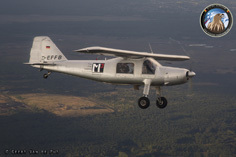 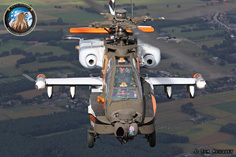 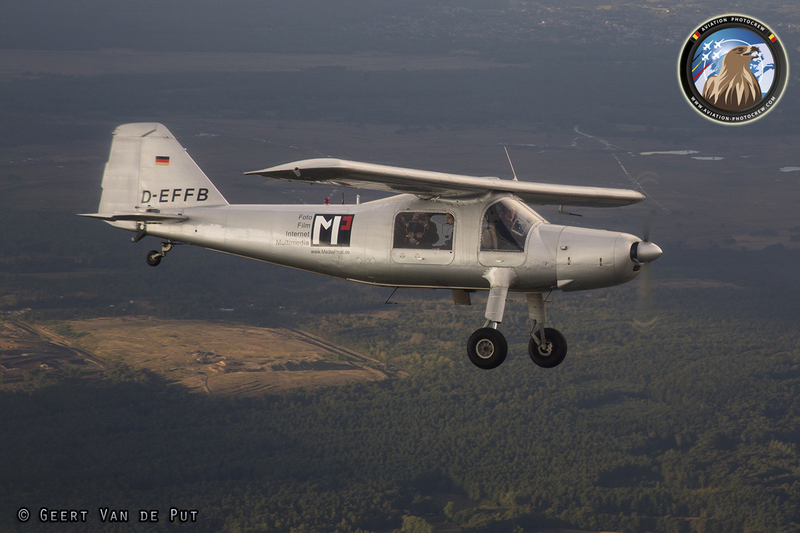 During the ferry flight from Kecskemet to Kleine Brogel, the well briefed photo mission was executed as planned. 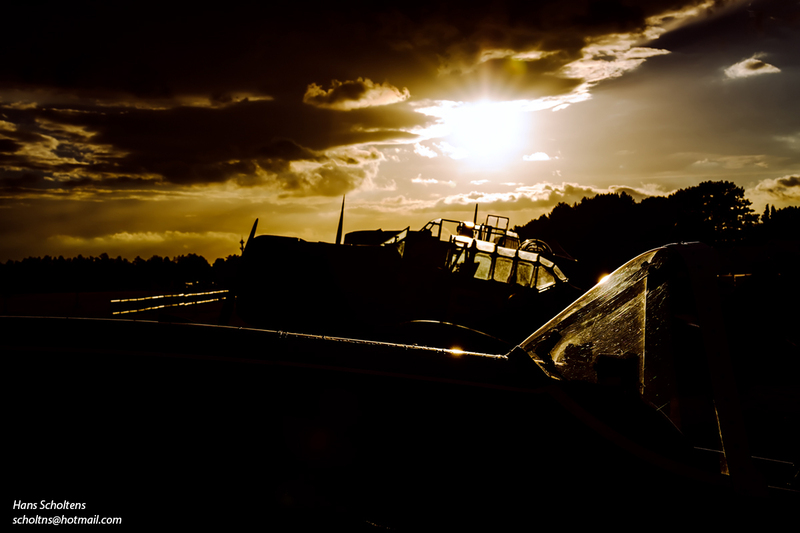 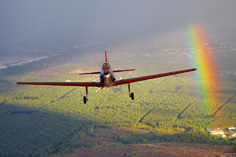 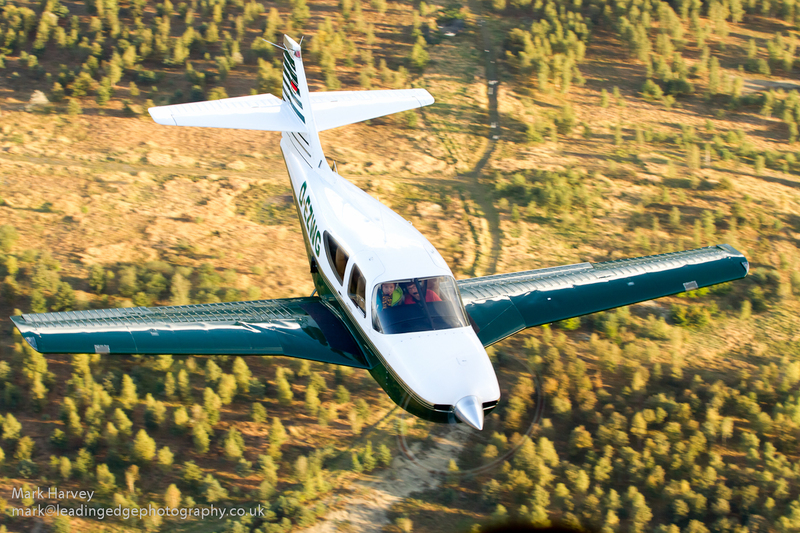 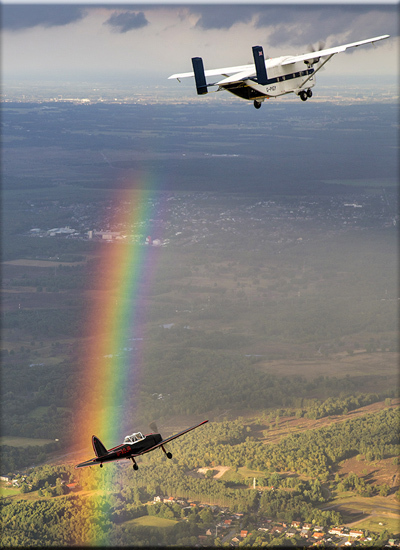 The nice early-morning light as well as the great flying of the Pilot made this photoflight really special. 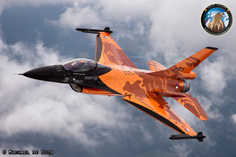 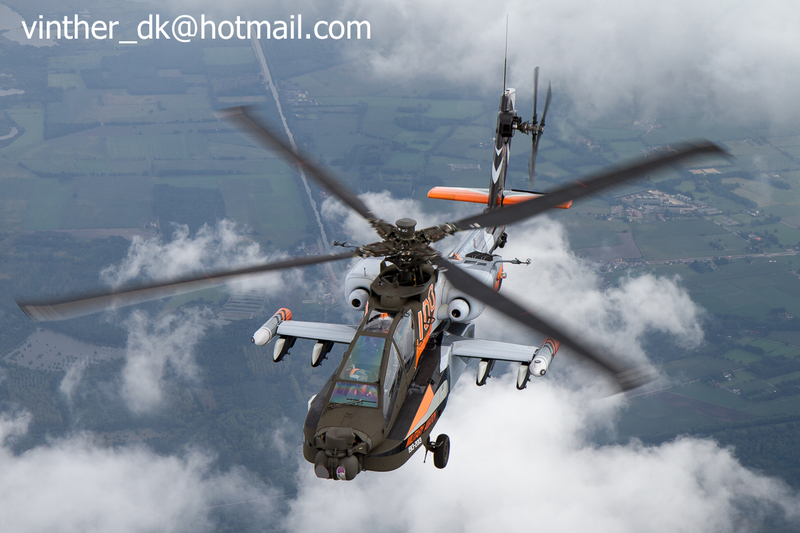 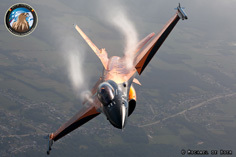 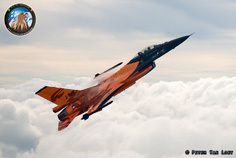 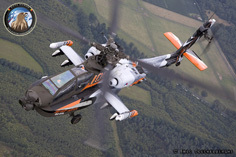 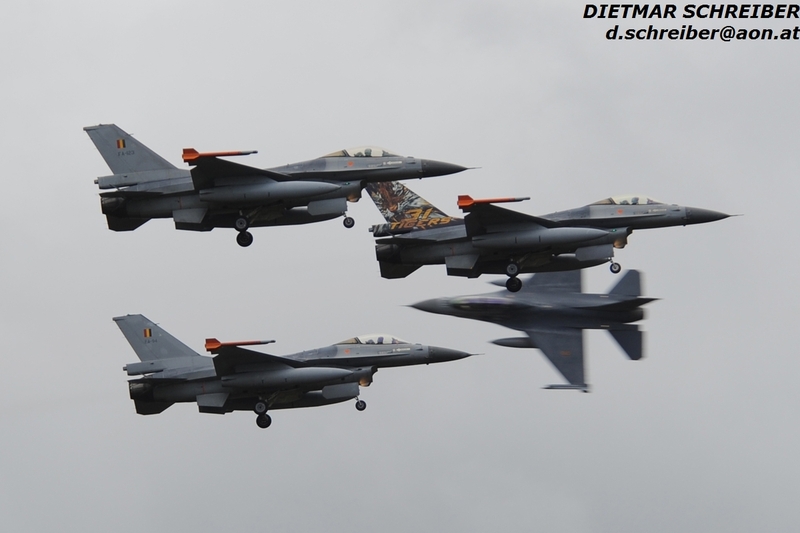 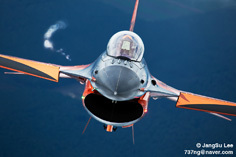 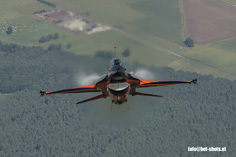 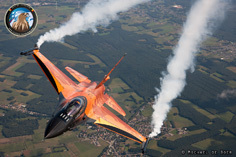 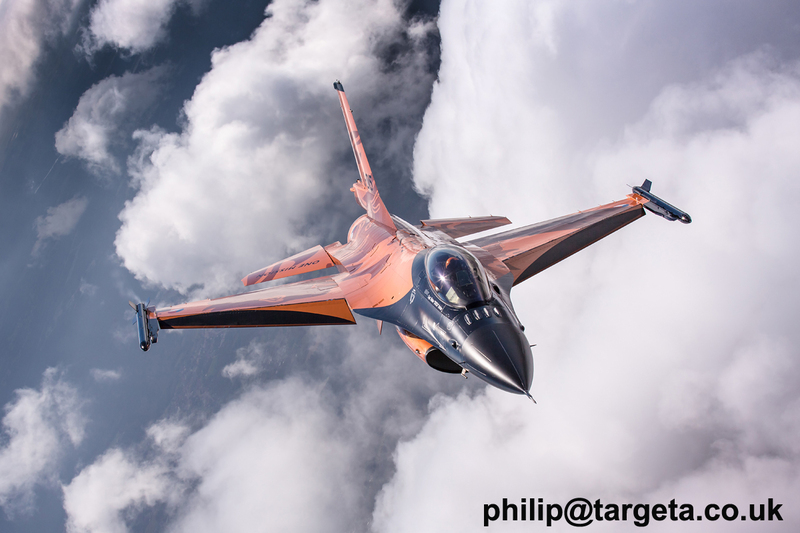 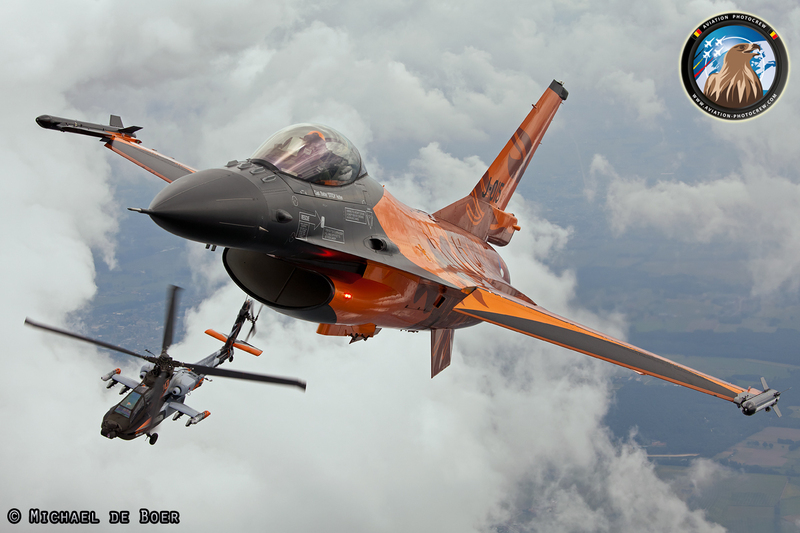 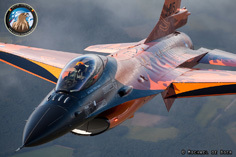 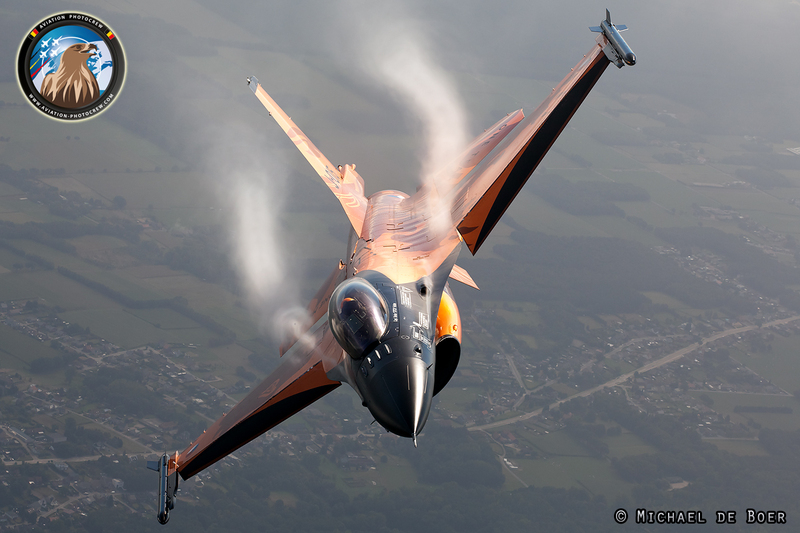 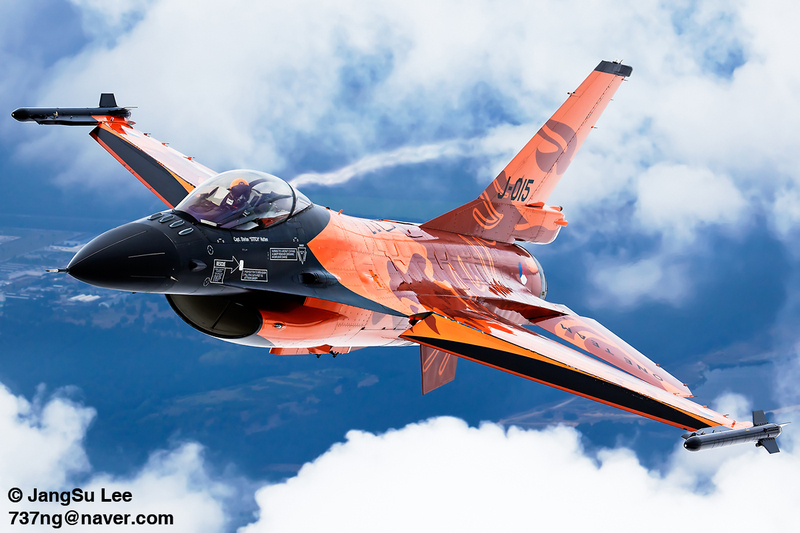 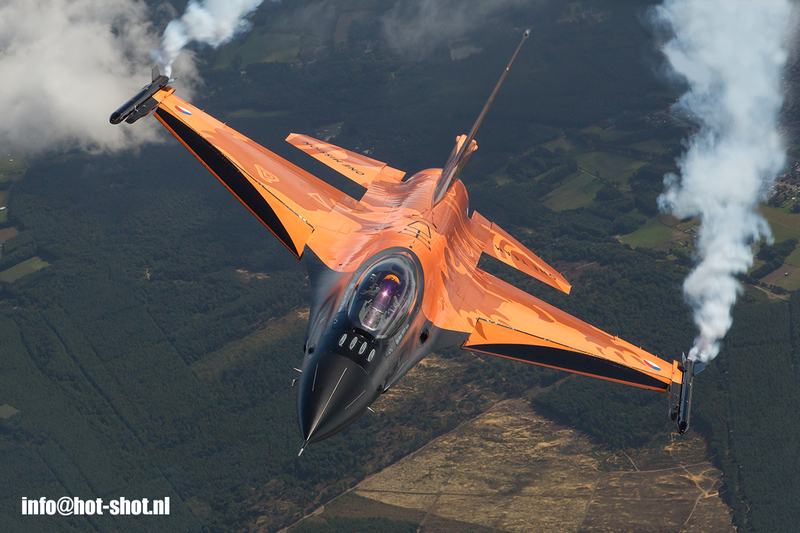 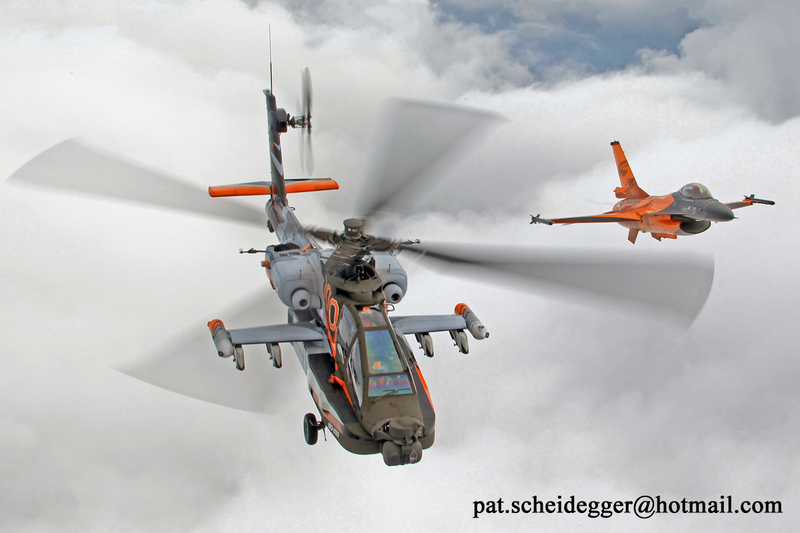 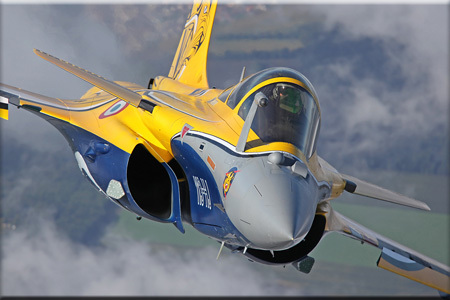 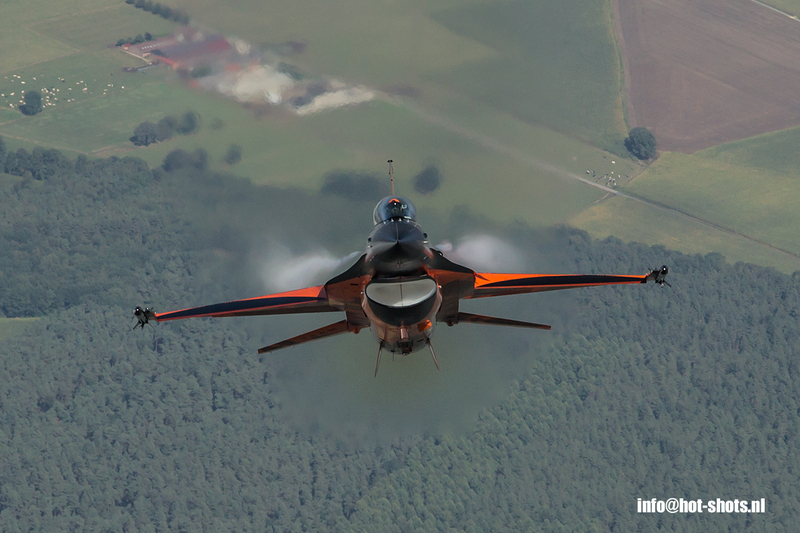 The Royal Netherlands Air Force have been very cooperative during the past years and many of our photographs were used to promote the Demo Teams. Especially for the occasion a unique formation photoshoot was organized bringing both Apache and F-16 Demo Teams together. 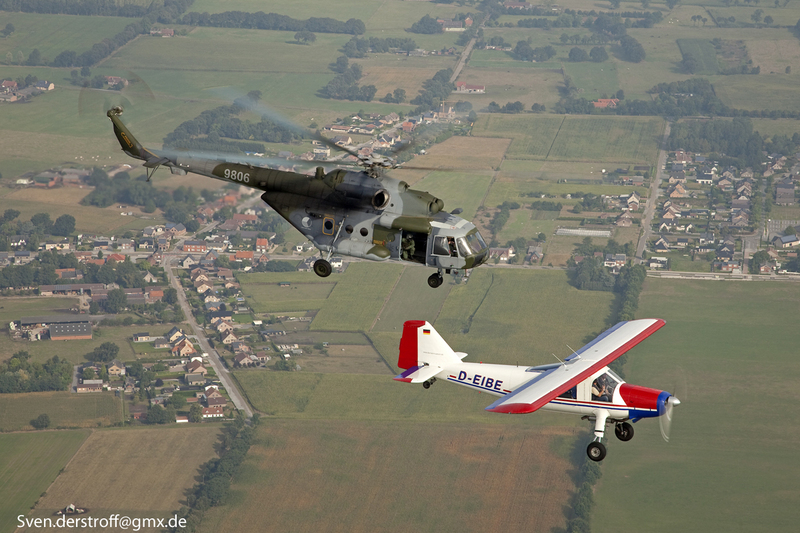 What a unique sight to see these two really different flying machines together in close formation. 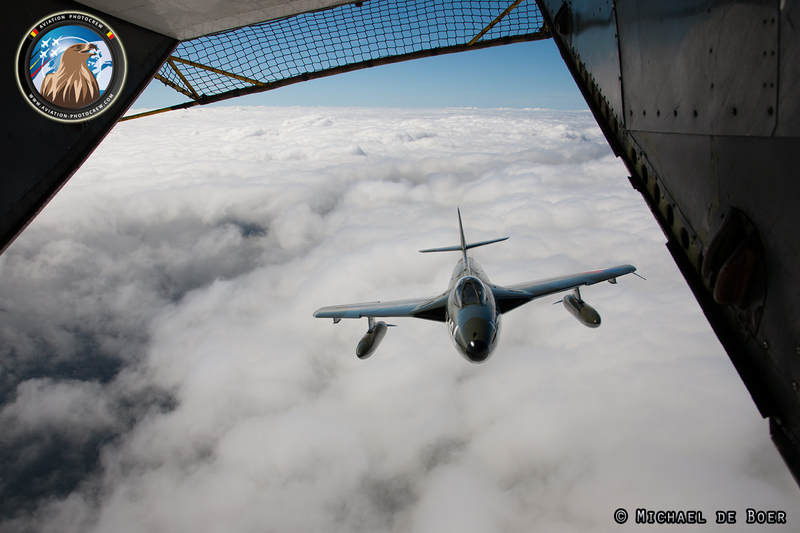 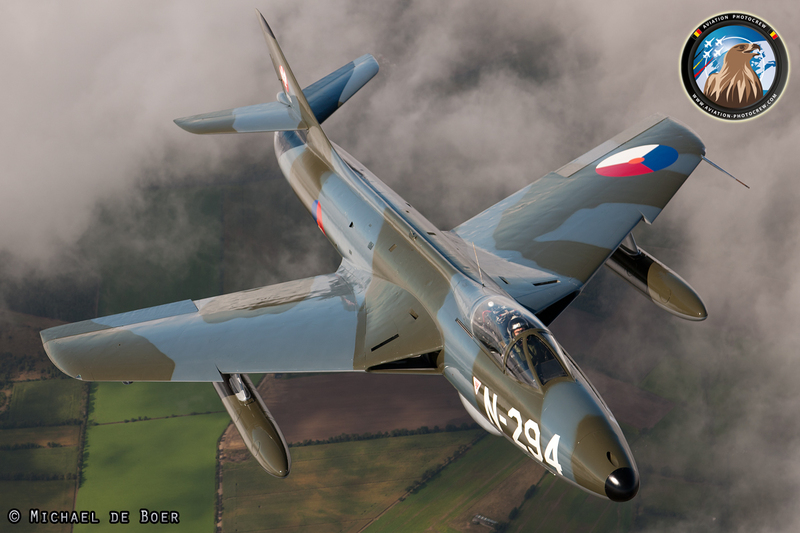 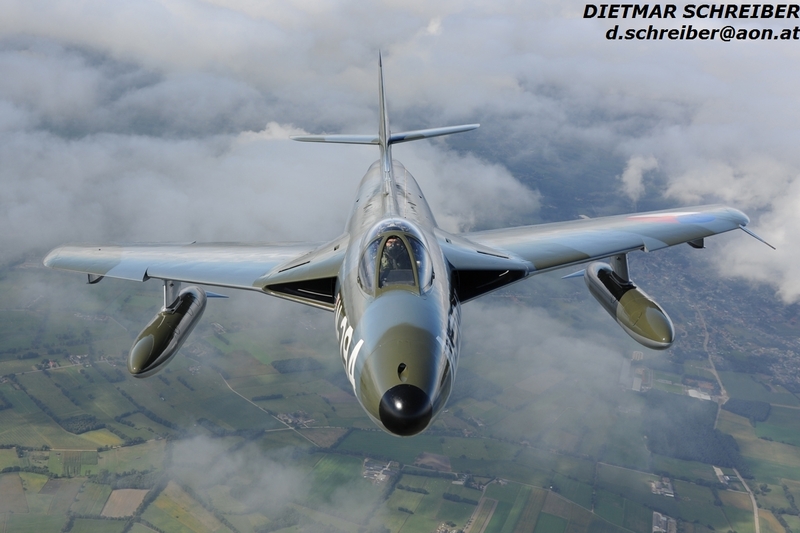 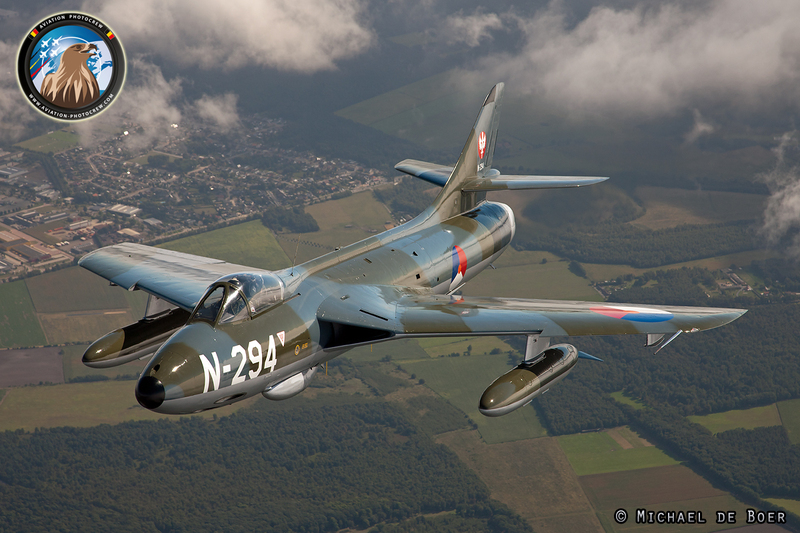 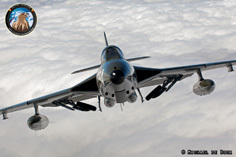 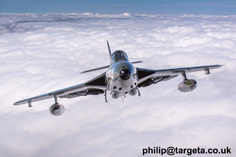 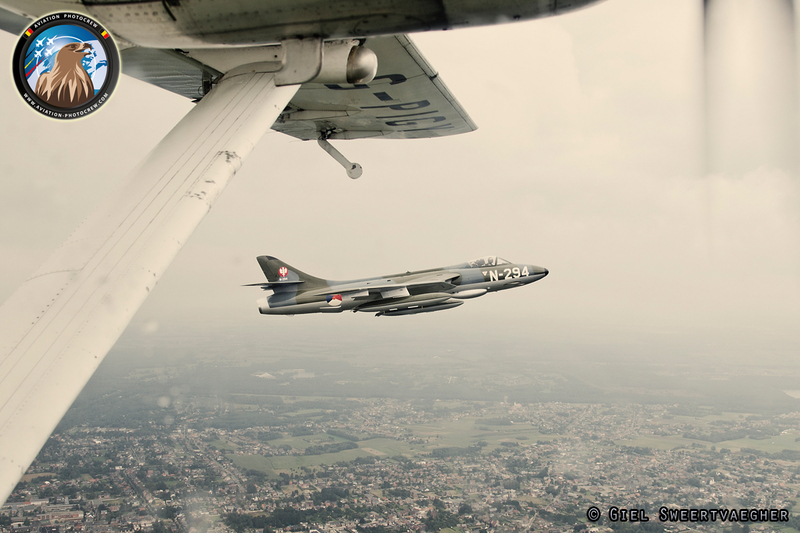 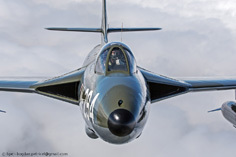 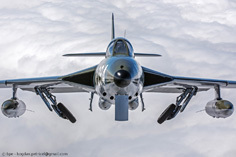 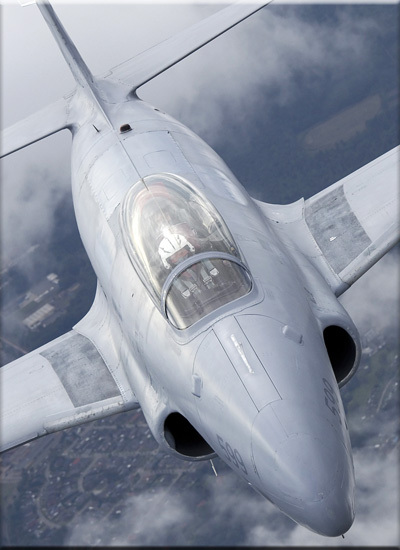 Another great photo mission with the classic Hawker Hunter was flown over the Pampa Range. 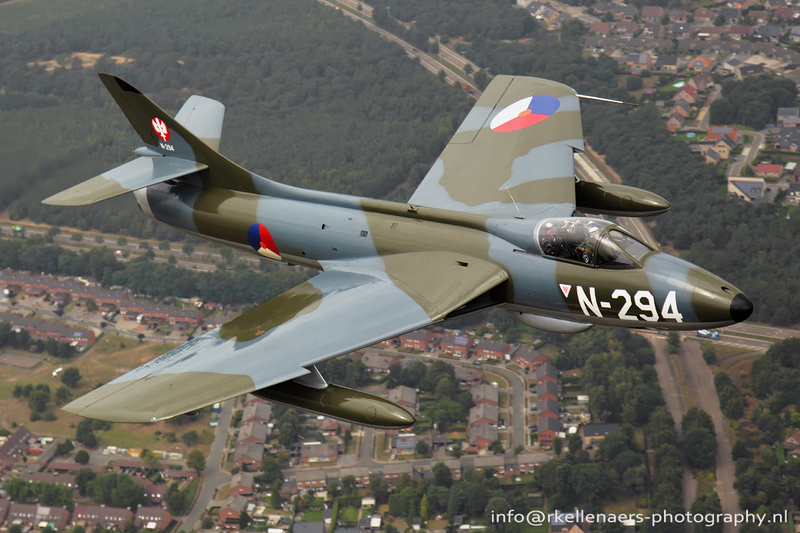 It still is one of the best looking Jets, especially when so nicely presented by display pilot Patrick Tuit. 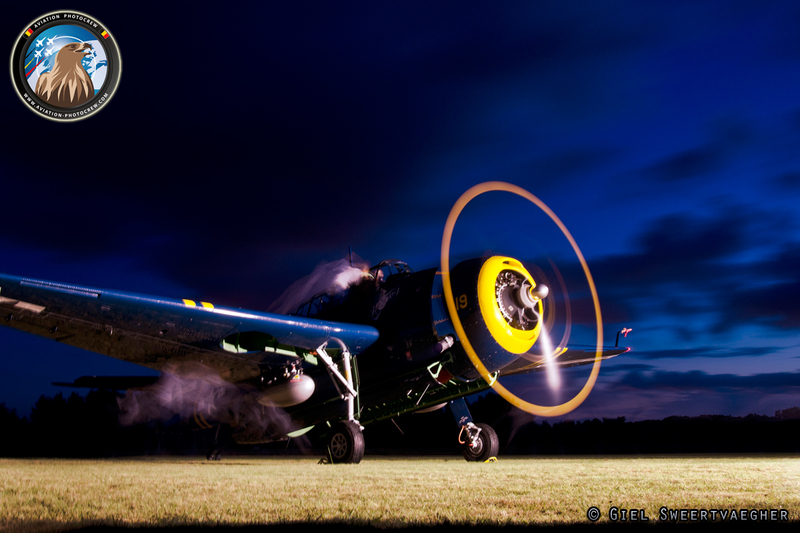 As the Sanicole show started on Friday evening, the Warbirds were flown to Kleine Brogel AirBase, to participate the Spottersday on Saturday as well. 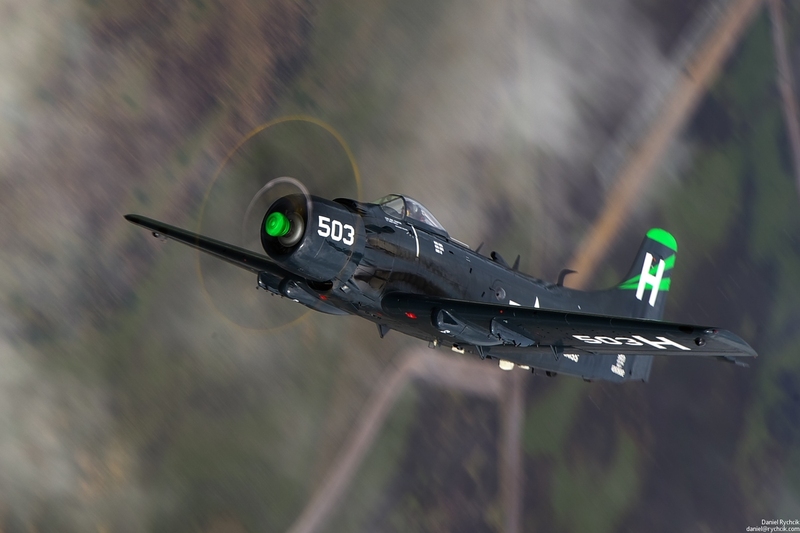 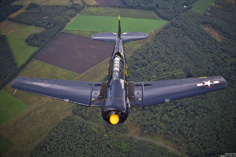 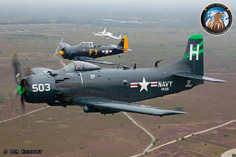 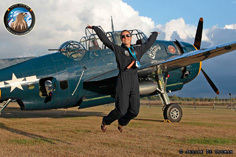 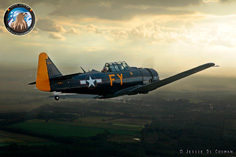 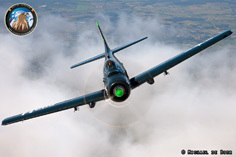 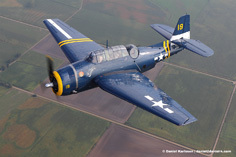 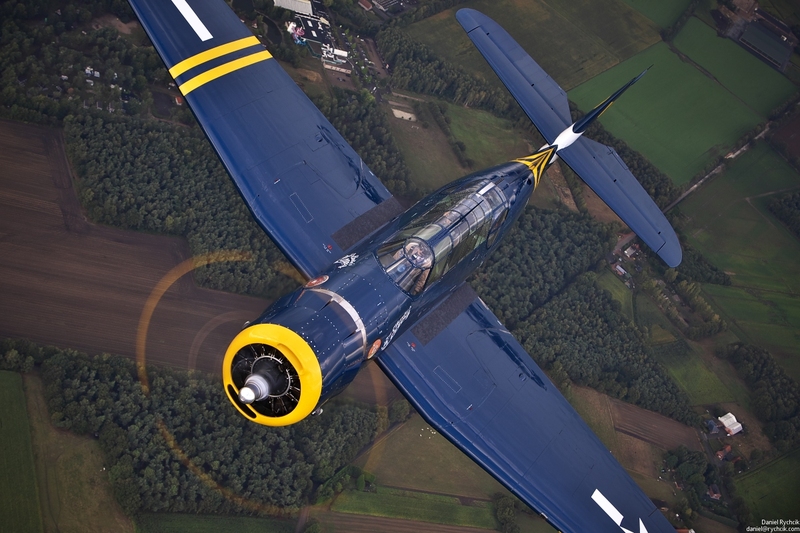 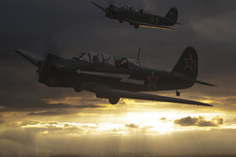 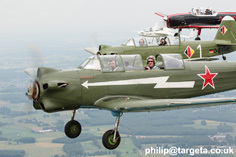 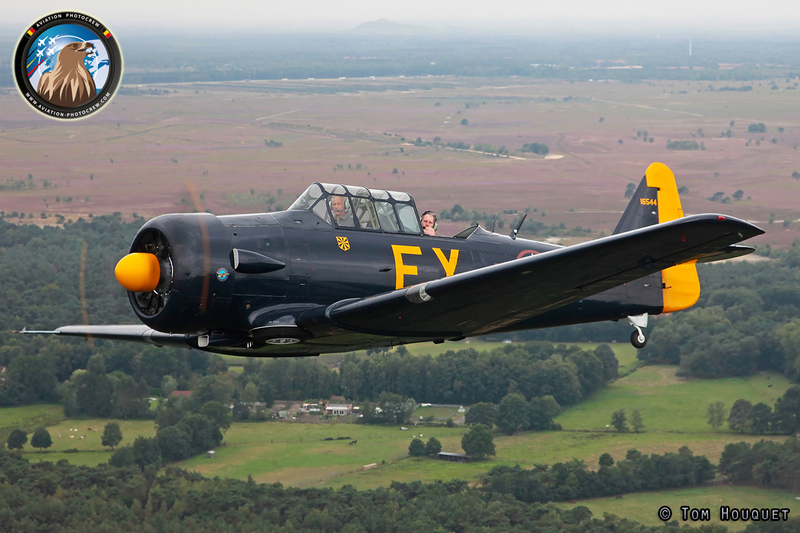 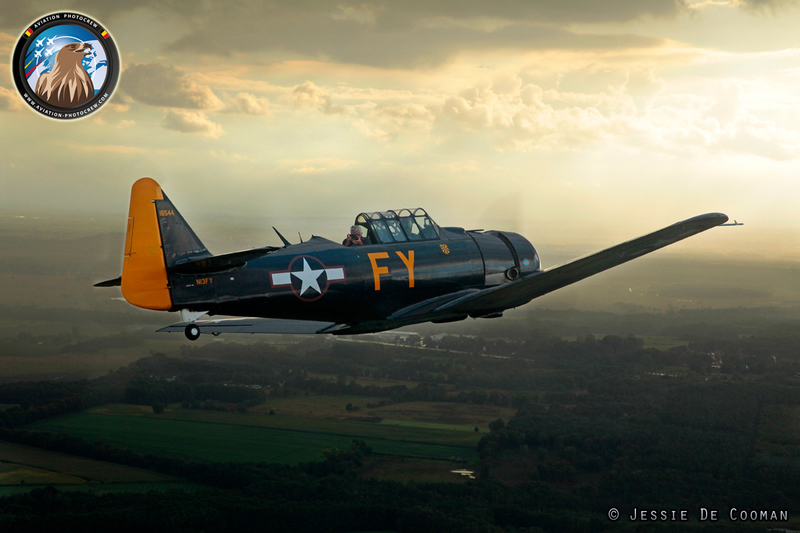 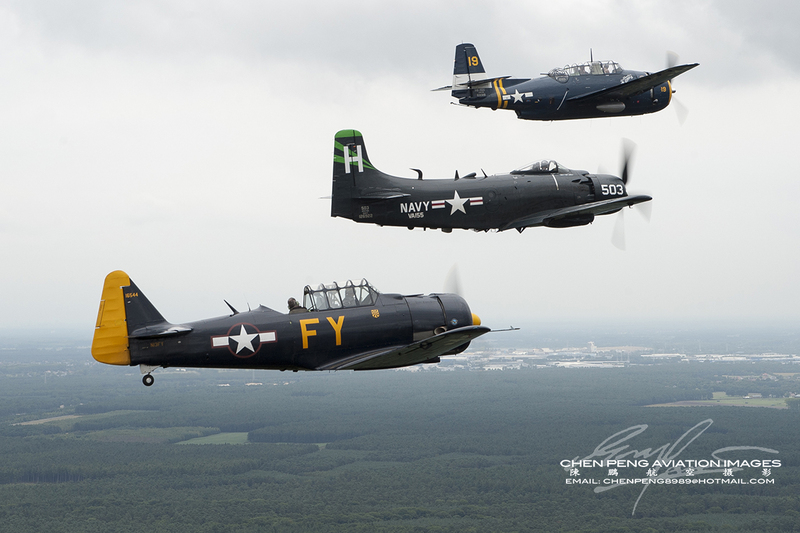 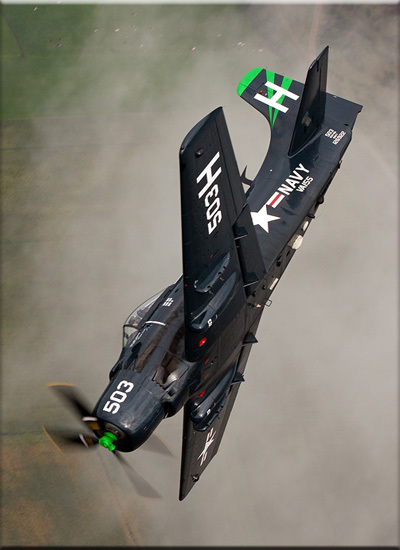 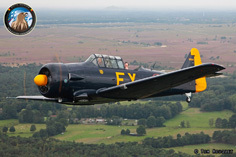 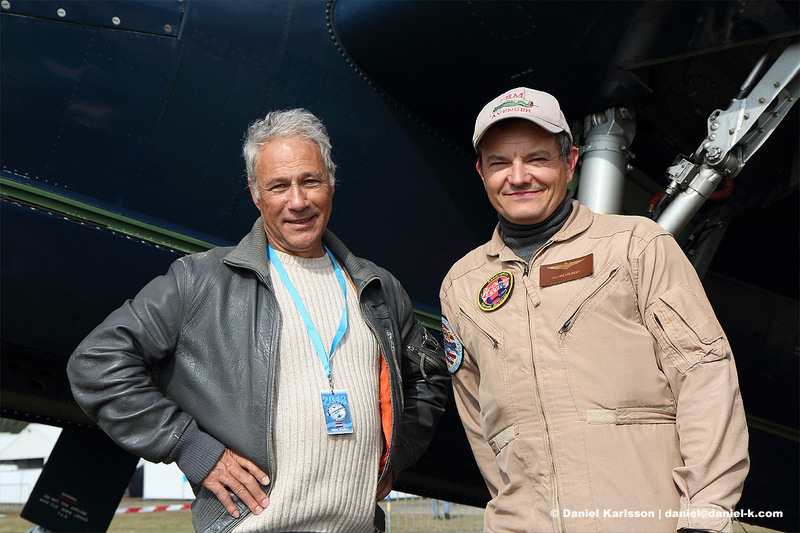 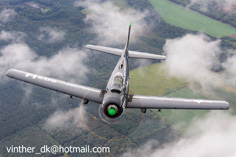 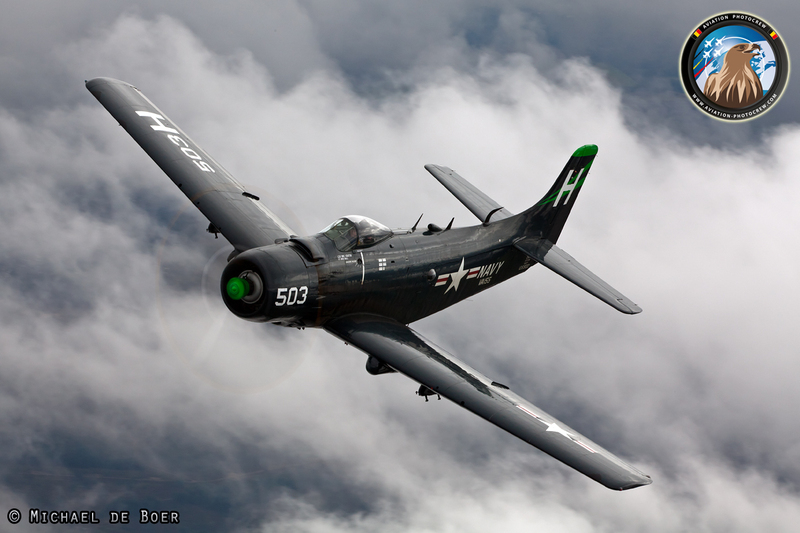 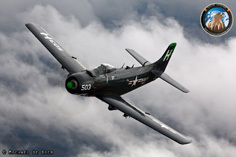 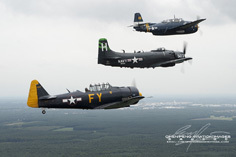 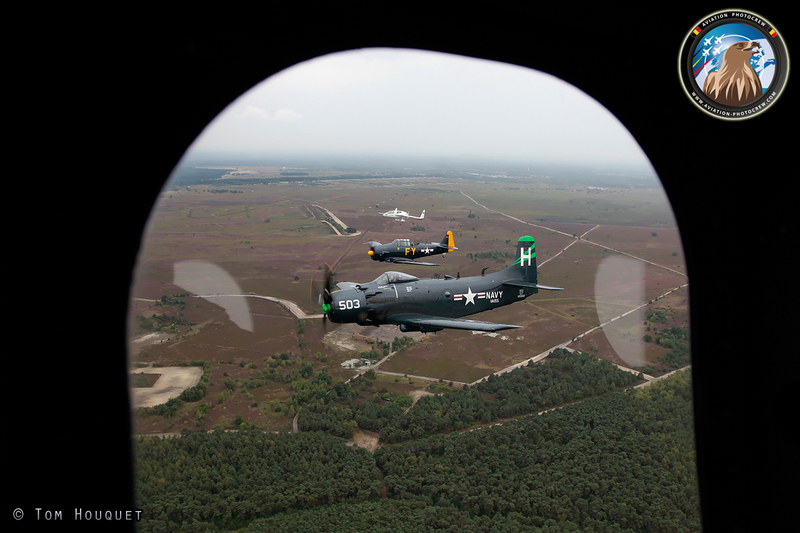 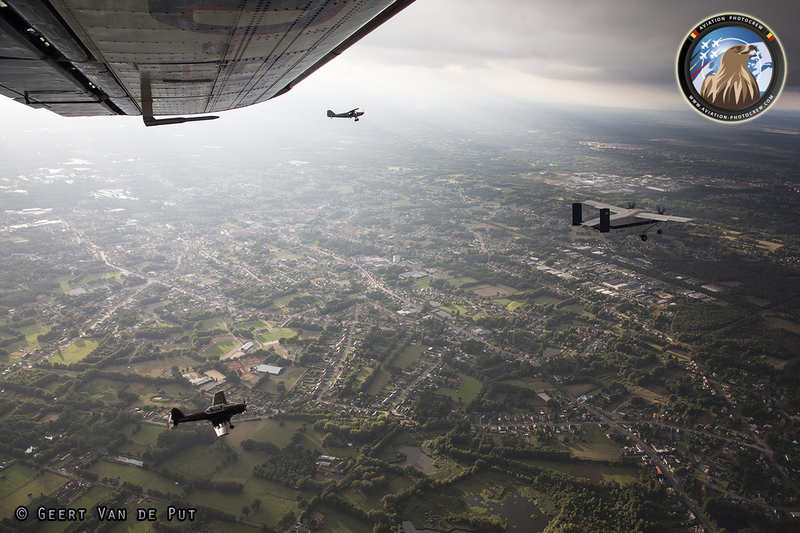 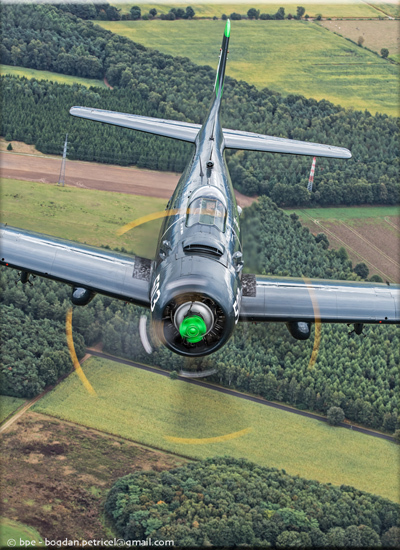 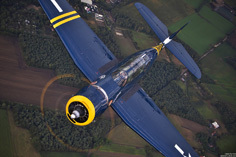 The occasion was taken to fly a very special “Blue Formation” of the Avenger, Skyraider and T-6 together. 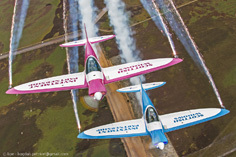 The Speedcanard acted as a photoship to frame this unique formation. 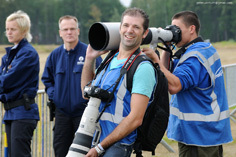 Friday evening the photographers could enjoy the unique atmosphere of the Sanicole Sunset Show. 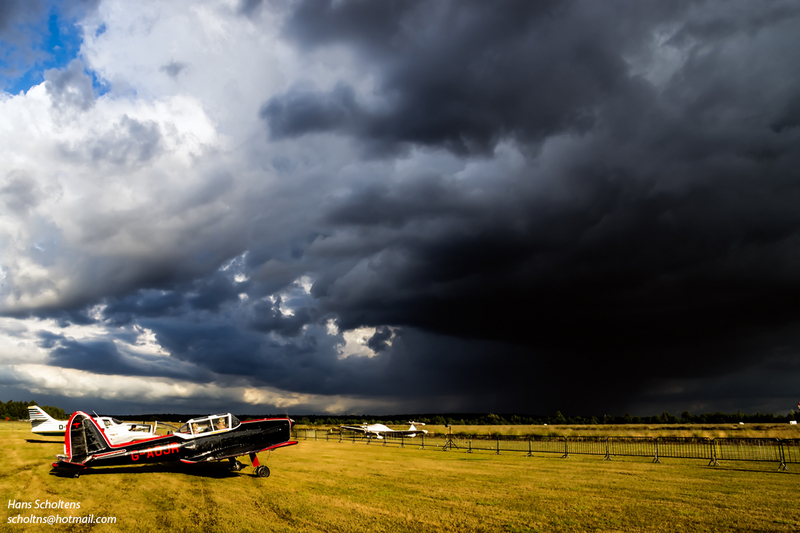 On Saturday the weather forecast was really looking bad. 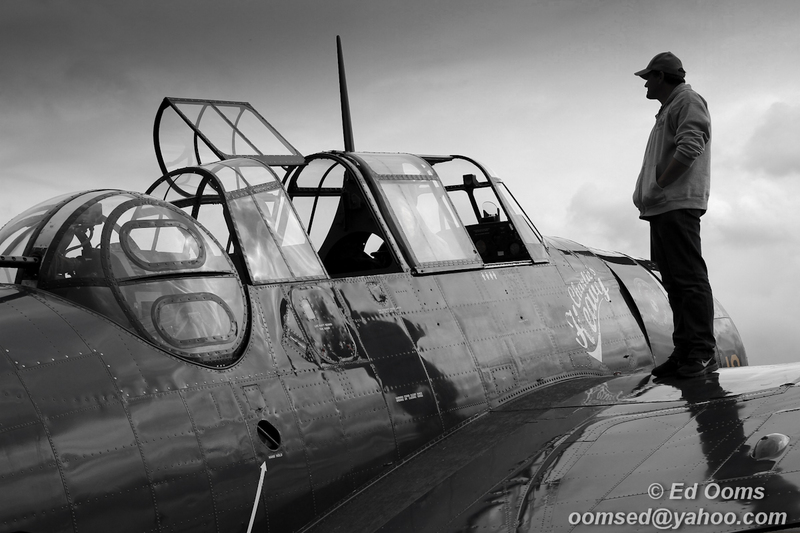 Some of the planned Warbirds unfortunately had to cancel because of the bad conditions on the way to Sanicole. The big Warbird formation was cancelled as well, but an extra flight was organized with the SWIP team. 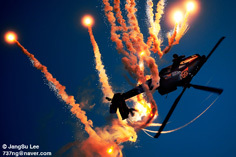 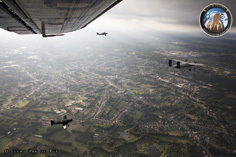 The two Spitfire look-a-like Silence Twister flew a close formation behind the Skyvan and they used their famous smoke and fireworks giving extra effects to the photographs. 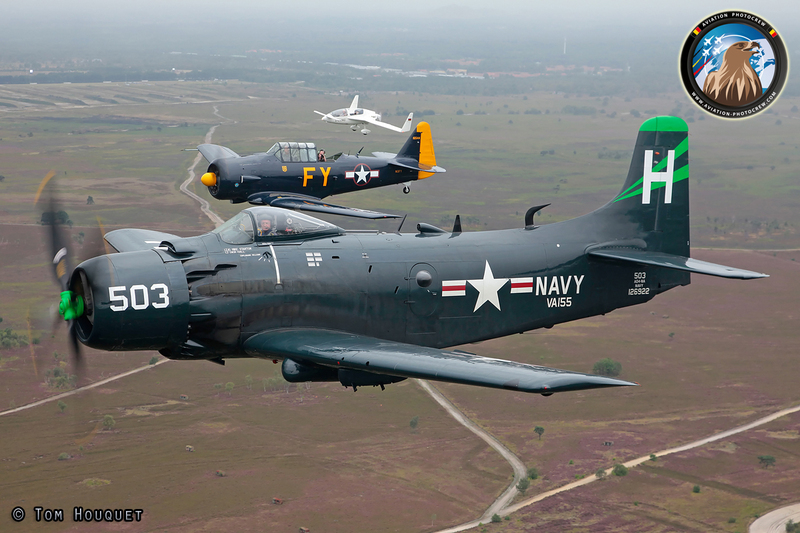 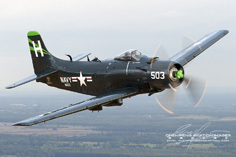 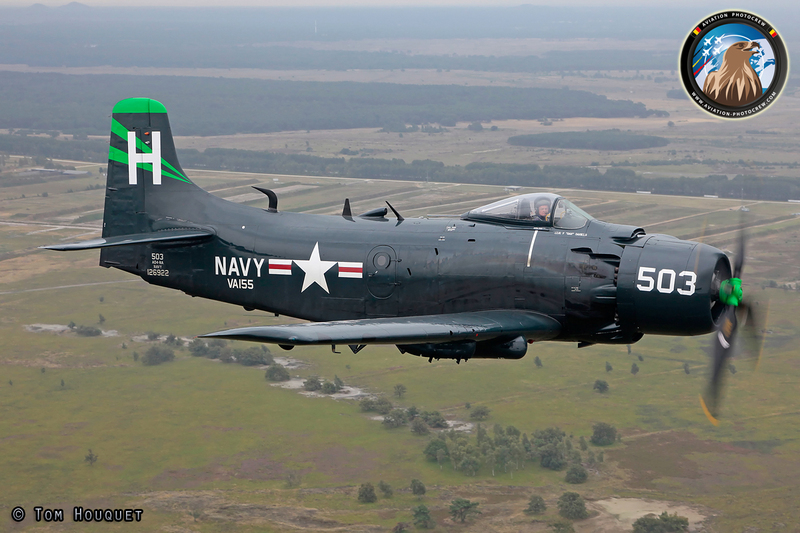 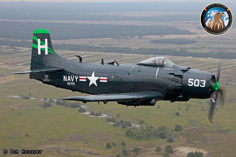 Not only the SWIP team flew behind the Skyvan, also the UK-based Skyraider joined in, giving the photographers a private Airshow. 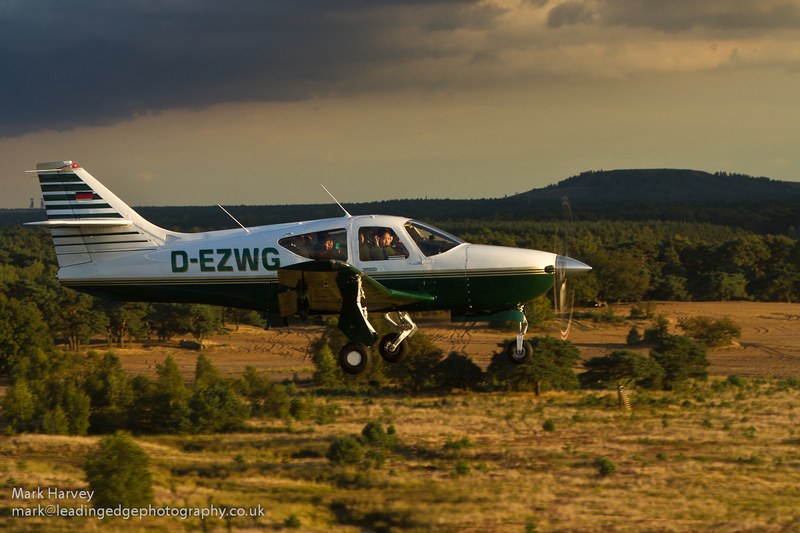 Sunday was the big Sanicole Airshow day, so it was time to relocate the Skyvan, and Zwartberg Airfield played a great host for the planned photoflights. 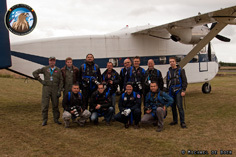 Two photo missions were planned in the afternoon, as the weather conditions were proving really good. 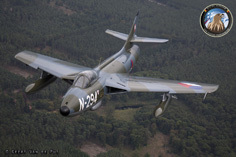 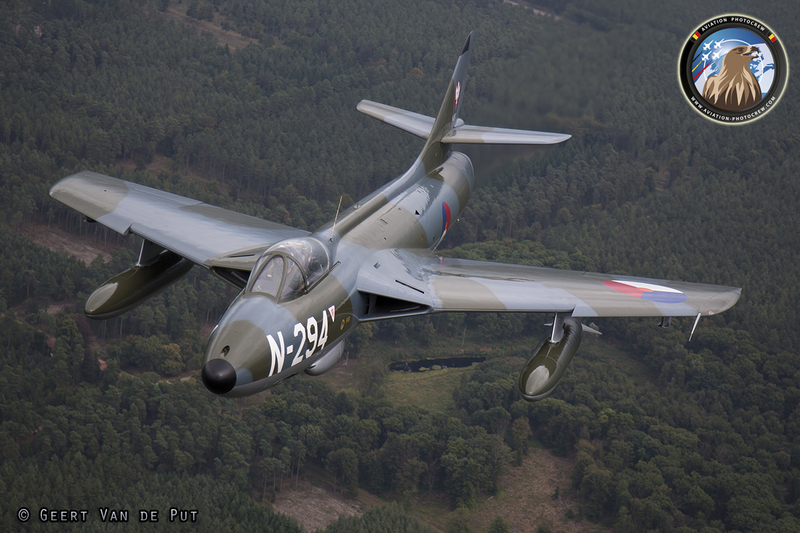 The Dutch Contingent was again really well presented with the Hawker Hunter, the Orange F-16 and the mighty Apache. 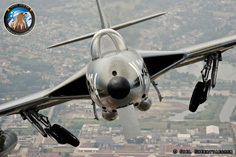 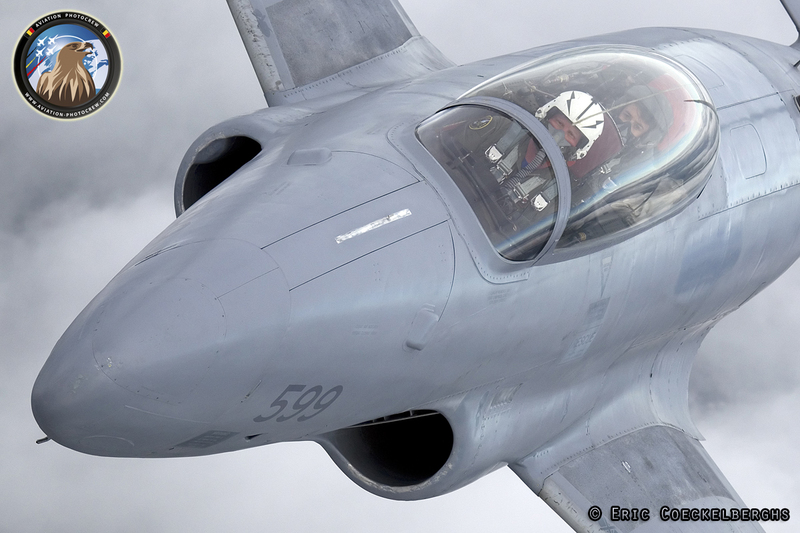 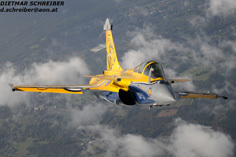 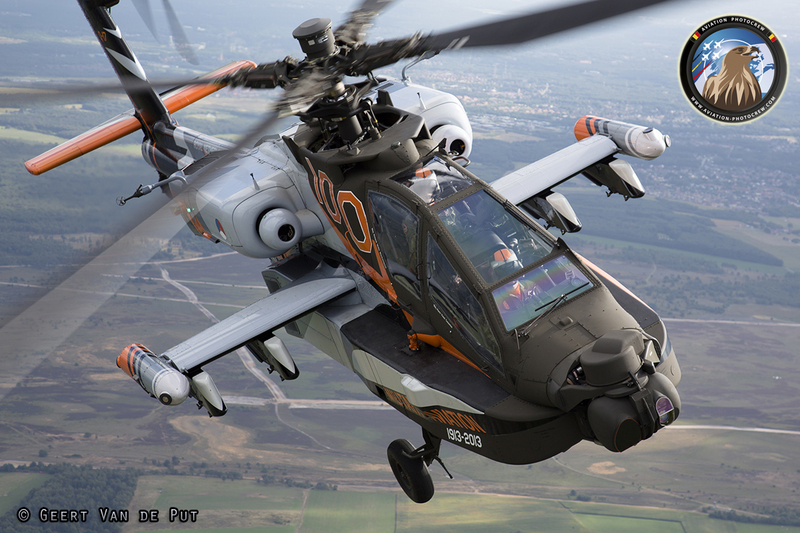 In 2014, the Swiss Air Force is celebrating their 100th Anniversary with a large Airshow in Payerne. 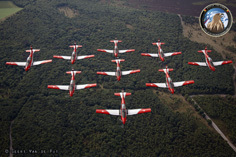 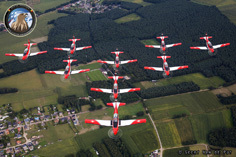 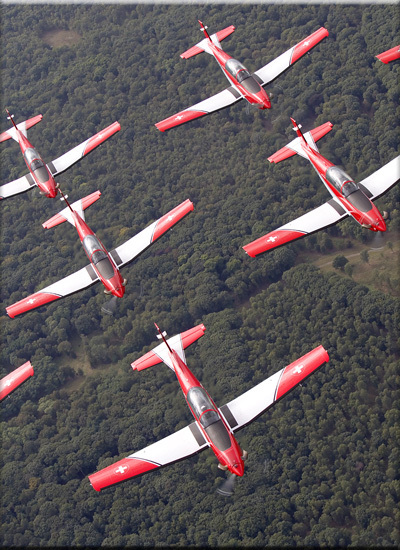 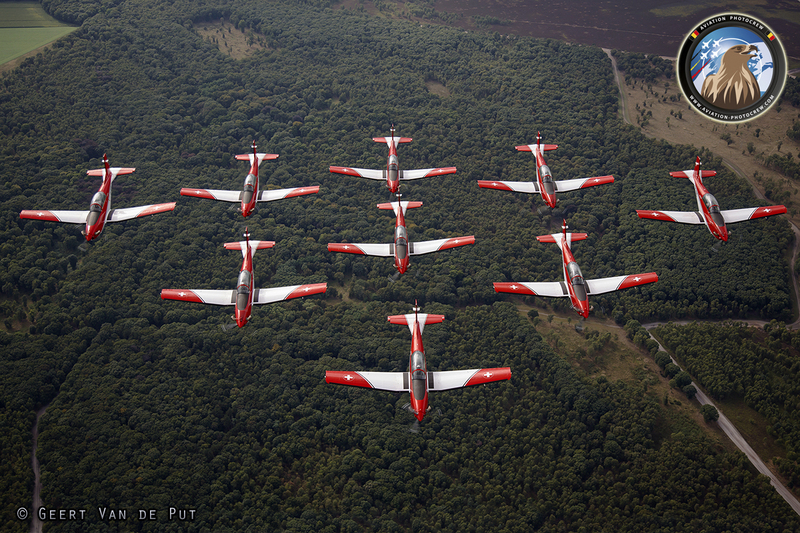 As the cooperation with the Sanicole Airshow is so good, they send the Swiss Air Force PC-7 TEAM over to Belgium to perform at the show. 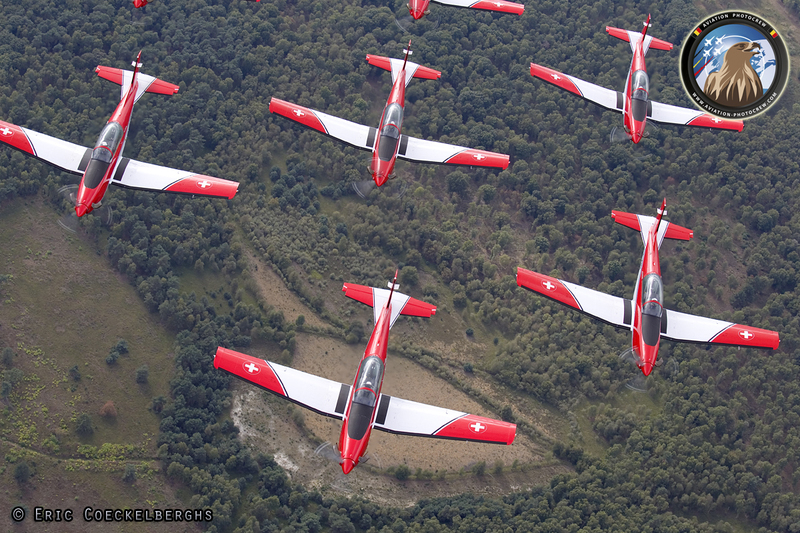 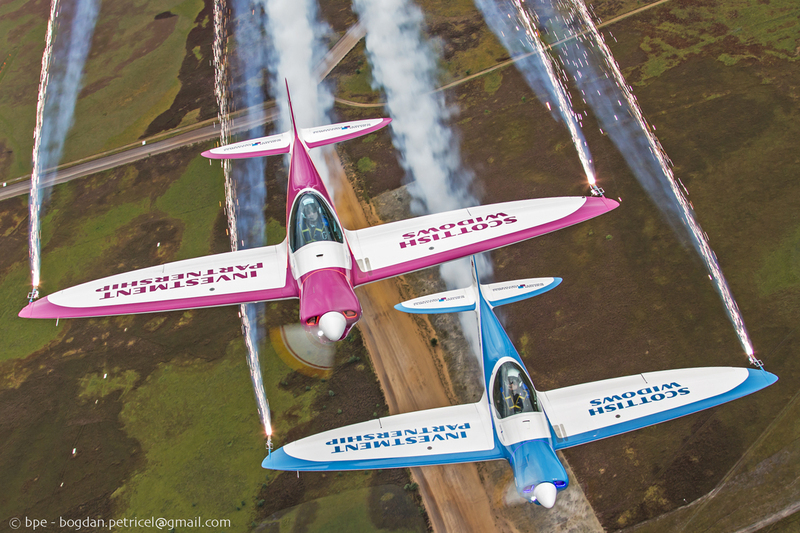 It was a great pleasure to have the team willing to fly for pictures after their performance, flying the nine PC-7 Aircraft in a nice range of formations over the Pampa shooting range. One very special visitor to this year’s Academy was the classic T-33 Shooting Star. 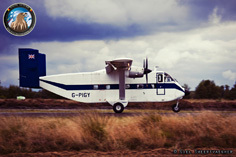 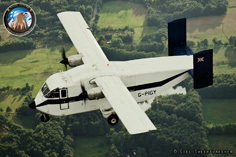 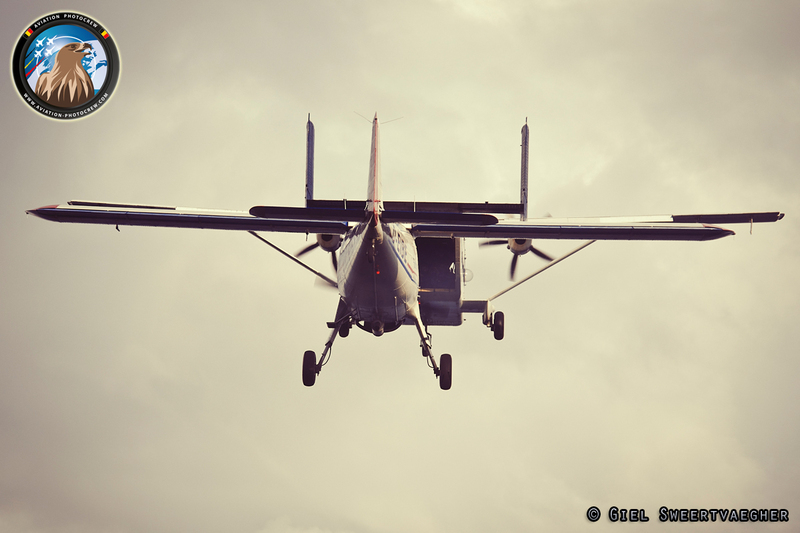 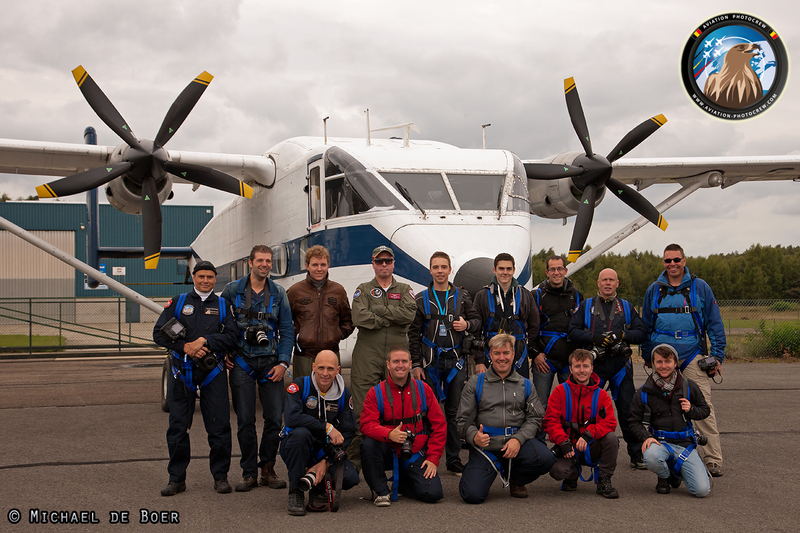 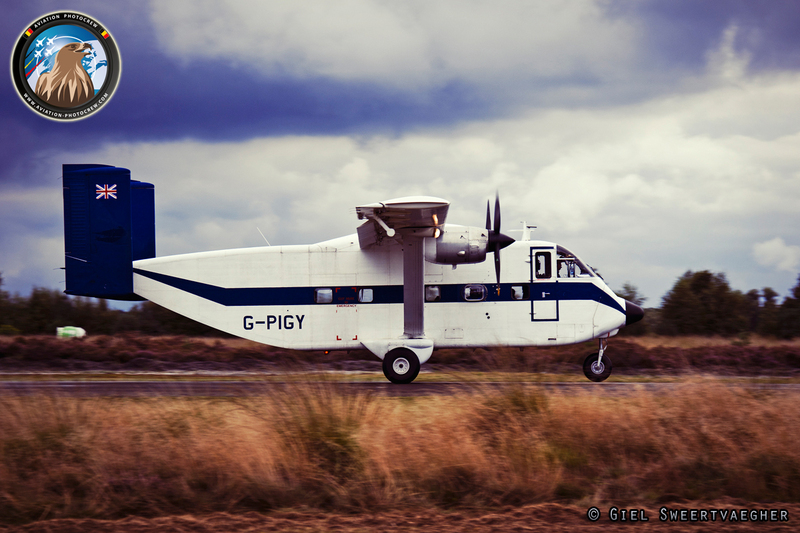 Coming all the way from Norway, they were a very welcome guest to fly behind the Skyvan photoship. 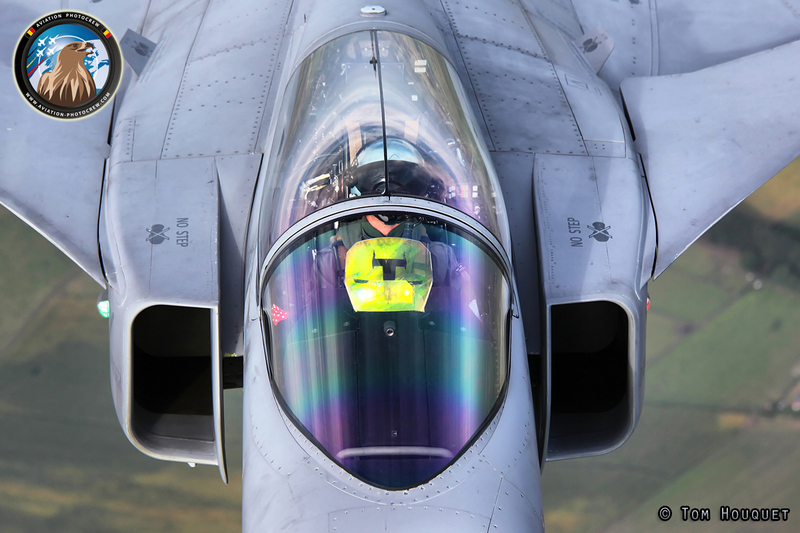 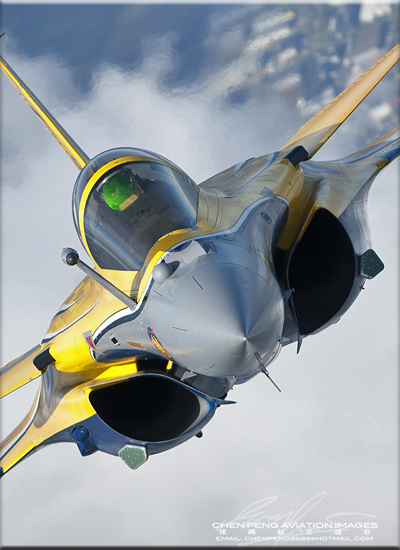 The highlight for many photographers was to photograph the mighty Rafale Air-to-Air, and they were not disappointed. 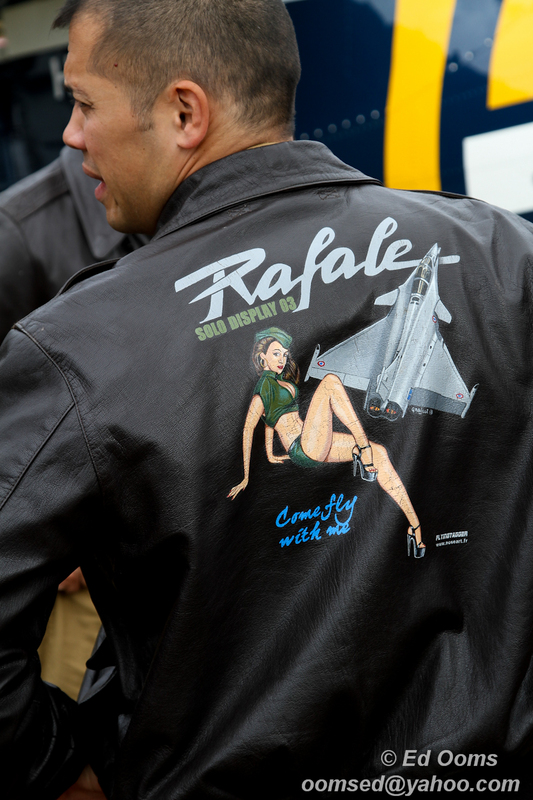 The French Air Force send over their specially decorated Tiger Rafale, and on Sunday, display Pilot Cpt Benoit ‘TAO’ Planche showed of his skills for a very special photo mission. 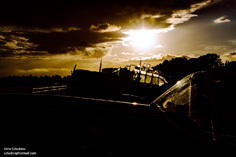 On Monday morning, the Sanicole airfield was awakening from a fantastic weekend, but the photoflights were not finished yet. 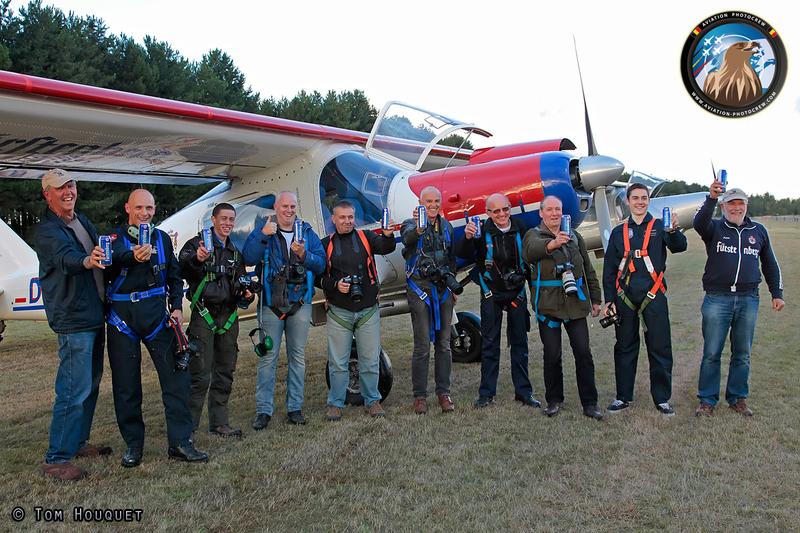 Some of the most dedicated photographers received a very special surprise, they had the chance to fly onboard the Breitling Super Constellation back to their homebase in Basle, we saw some really happy faces! As all the Airshow participants were bound for home after a great weekend. 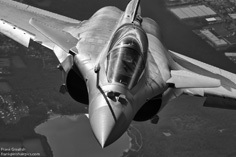 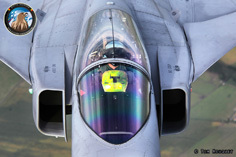 The two French Air Force Rafales closed this year’s Academy with a unique action photoshoot. 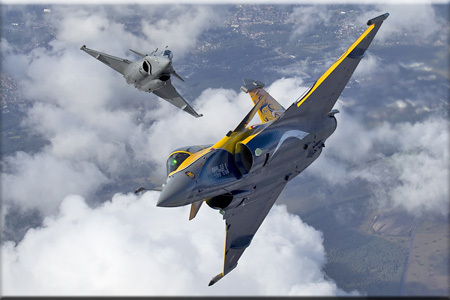 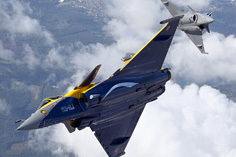 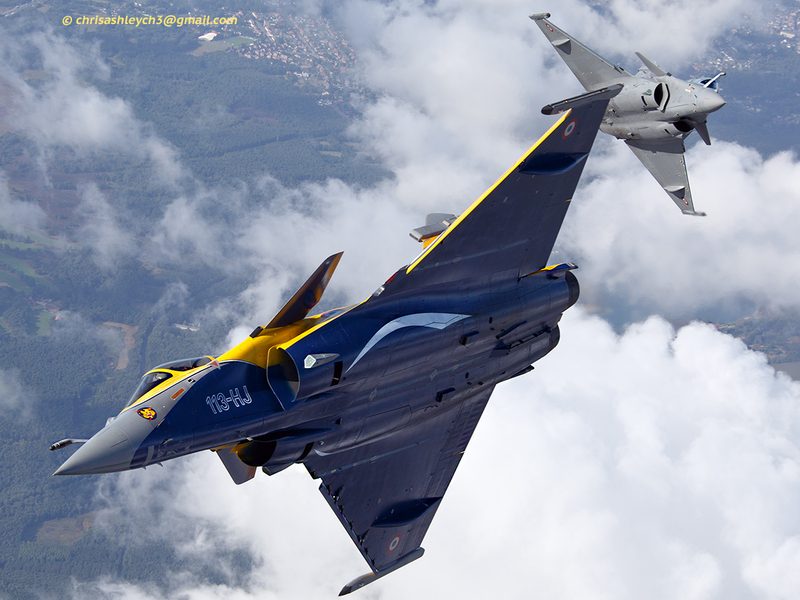 The goal was to make an exciting cross-break picture of both Rafales. 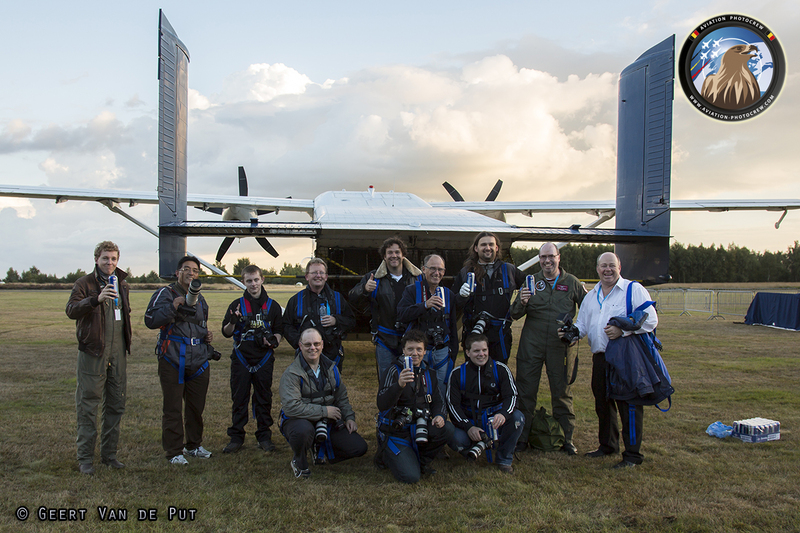 The photographers had three chances to make THE picture, and together with the most beautiful weather conditions it was one of the best photoflights we have ever done, thank you so much! 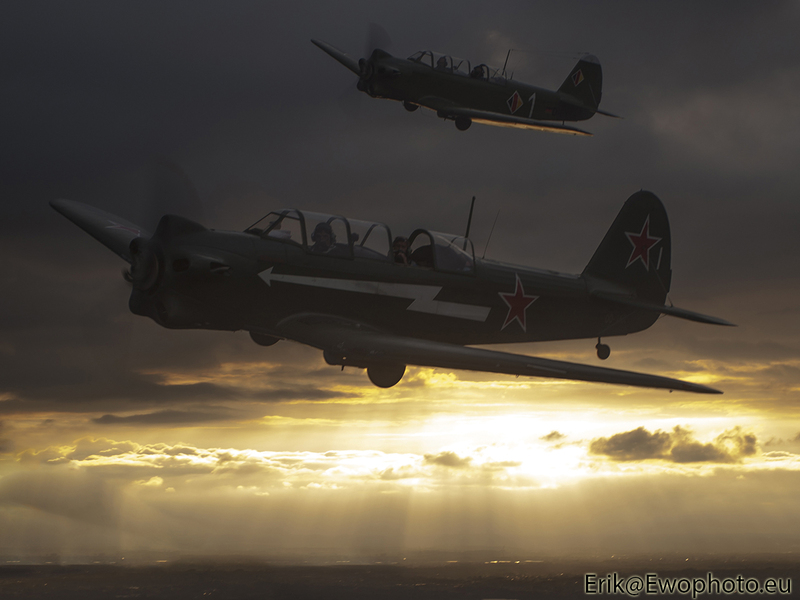 In the past years we have done some really unique photoflights, but this year the Air-to-Air Academy was unique in many ways. 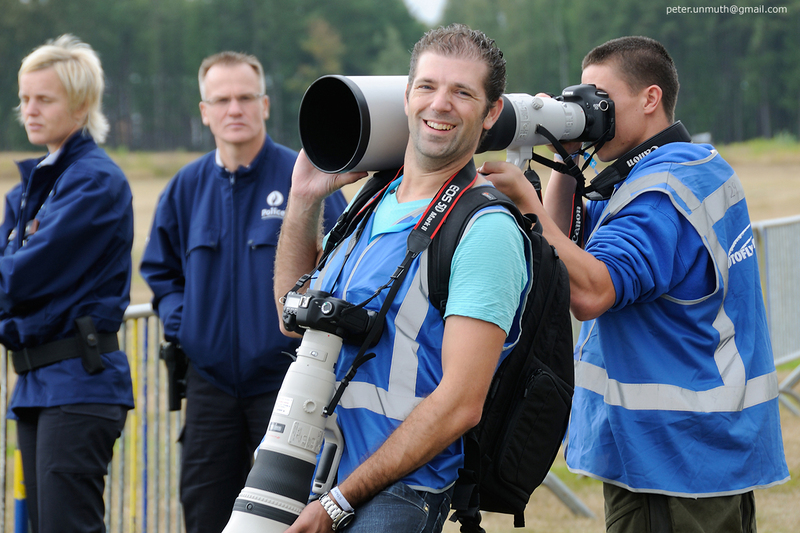 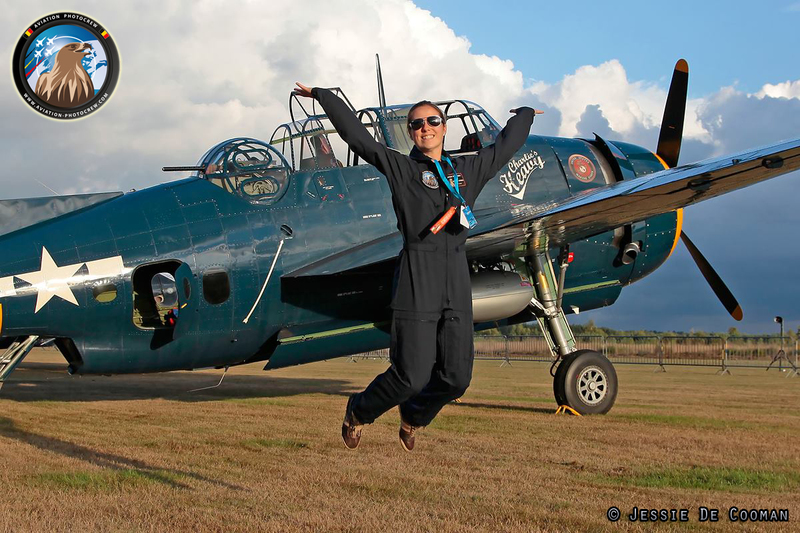 The cooperation with the Sanicole Airshow really worked-out very well, and it gave the attending photographers a great variety of photo opportunities. 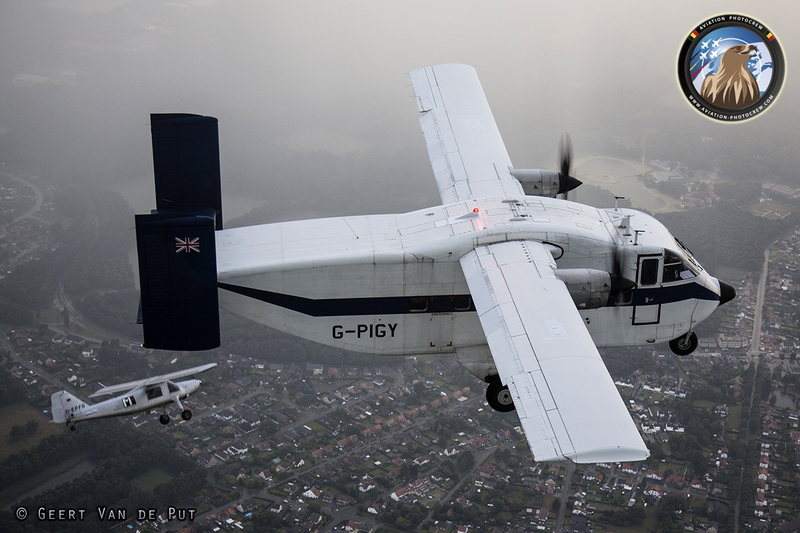 Despite the bad weather forecasts, most of the planned Photoflights took place, and the photo results are really stunning! 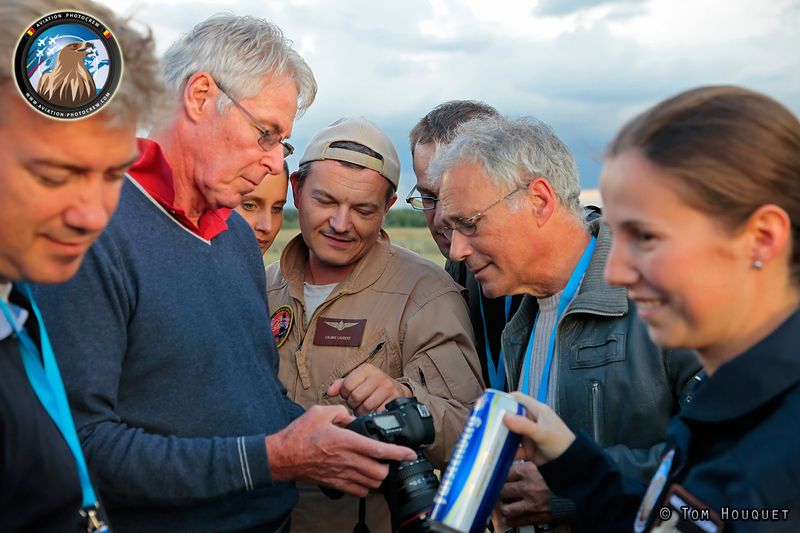 We would like to pay special tribute to all the people who made this fourth edition such a great success. In the first place the Sanicole organization, flight planning, the many pilots and crews, Kleine Brogel Air Base personnel, Belgian Air Force ATC, Swiss Air Force, Royal Netherlands Air Force, French Air Force, Hungarian Air Force, Canon Professional Services, Zwartberg Airfield and everyone else for the great cooperation. 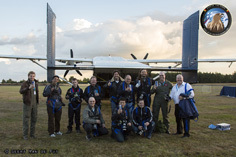 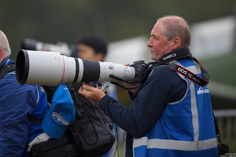 Not forgetting the attending Academy photographers for their great help, without the great teamwork this would not be possible. 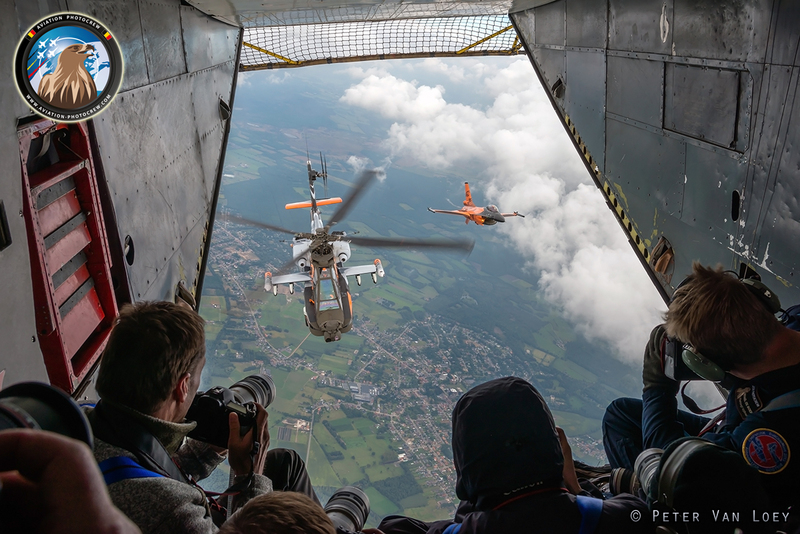 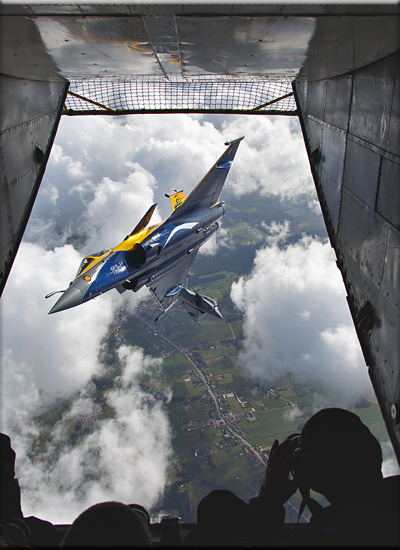 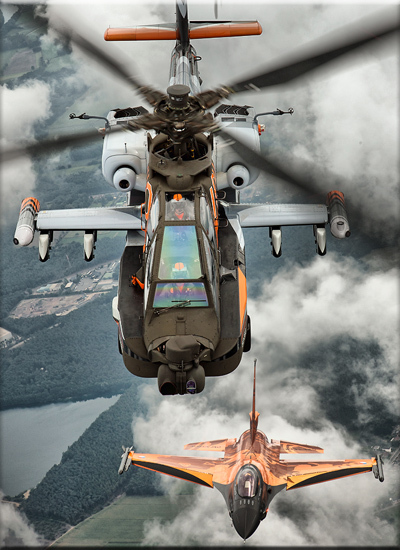 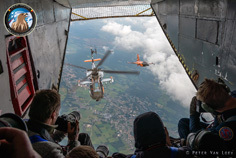 The images below are the best-of-the-best pictures made by the Academy photographers during the 2013 edition of the Air-to-Air Academy. 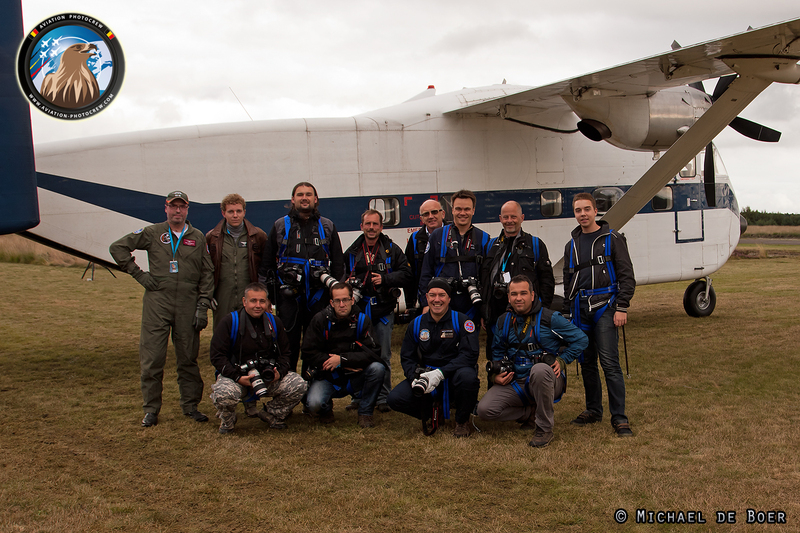 Many thanks to all the photographers for sharing these extraordinary images, and we hope to meet you again soon!